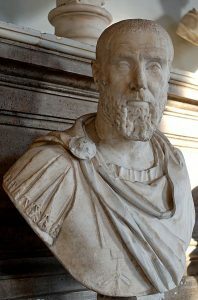 In the one hundred years between A.D. 98 and A.D. 192, Rome had five emperors: Trajan, Hadrian, Antonius Pius, Marcus Aurelius and Commodus — six if we count Lucius Verus, who was co-emperor with Marcus Aurelius for several years. In the fifty years following the death of the last of the Severan emperors, a young man by the name of Alexander Severus, who died in 235 A.D., Rome had twenty acknowledged emperors, and many more pretenders to imperial power. Rarely did anyone hold onto power for more than a few years, and some of them lasted only a matter of months. I like to think of the emperors as changing as quickly as the seasons, in the third century A.D. Any wrong move led to assassination and replacement, not by the Senate, but by the provincial armies, by the provincial armies. Civil wars were extremely commonplace in the third century A.D., and it was a very bad time for the Roman emperors, who could literally be stabbed in the back at any moment; and many of them were. The Roman frontiers were in danger, the economy was in shambles, and the vast bureaucracy was also suffering significantly in the third century A.D., largely because of a lack of central control. In view of this chaotic situation, there was very little time to build buildings, which is obviously what’s significant to us, in the context of this course. In many ways I think one can describe, vis-à-vis architecture, the third century A.D. as essentially a wasteland, an architectural wasteland. There were no forums in the third century A.D. There were no basilicas and there were no baths. We will see that the major project in the third century A.D. was not unexpectedly, given this situation, a major defensive wall. 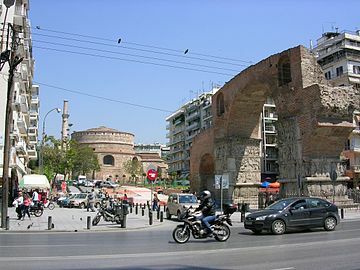 That was the main architectural commission in the third century A.D., and it’s with that wall that I want to begin today, the so-called Aurelian Walls. Before I do, I just want to give you a glimpse of two of those twenty acknowledged emperors who made their way through the third century A.D.: the boy emperor, Gordian III, above, and the more mature emperor, Pupienus (also above), who was co-emperor with a man by the name of Balbinus, for a very short time. And, in fact, just to give you a sense of the flavor of the third century, both of them [Pupienus and Balbinus] were dragged from the palace, not too long after they had ascended to imperial power, murdered and their bodies tossed in the Tiber River. If you look at these two portraits, one of the boy emperor and one of the more mature emperor, even though many, many years separate them in chronological age, I think you will see, if you look at the way in which these portraitists represented their eyes, in the likenesses of these two individuals, in these official portraits of Gordion and of Pupienus, I think you’ll see, if you look at those eyes, that those eyes reveal the concern that these emperors had for the state of the Empire during the third century A.D.: a concern that was extremely warranted, obviously. So again I want to begin with the only significant architectural project in the third century A.D. in Rome, and that is this great defensive wall system called the Aurelian Walls. 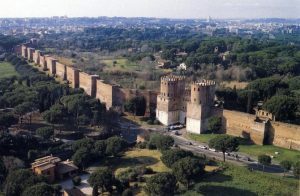 The Aurelian Walls were built for two main reasons: one, because the earlier walls, the so-called Servian Walls, which date to the Republic–378 B.C. 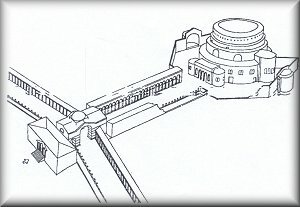 is when they were dedicated; so way, way back in the beginning of our discussion of Roman architecture–you’ll remember that those Servian Walls–and I show it to you with this plan (above) here of the walls during ancient Roman times–the Servian Walls encircled just the Seven Hills of Rome. 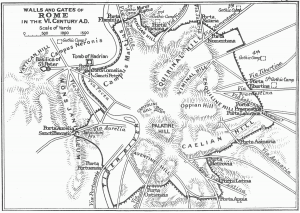 So this central area here, where we see the Palatine, the Capitoline, the Caelian, the Quirinal Hill, that was the location of that original Servian Wall. As the city grew, as the population grew, as more people were brought back to Rome, through the various wars and through the enslavement of large numbers of people, the city grew significantly in size. And so by this time, by the third century, the Servian Wall was essentially useless to protect Rome from those barbarians that were literally at the gates at this particular point in Roman history, so they needed to build that wall to protect the city. But the other reason was because of what was going on, on the frontiers, because Rome was more in danger than it had ever been before. 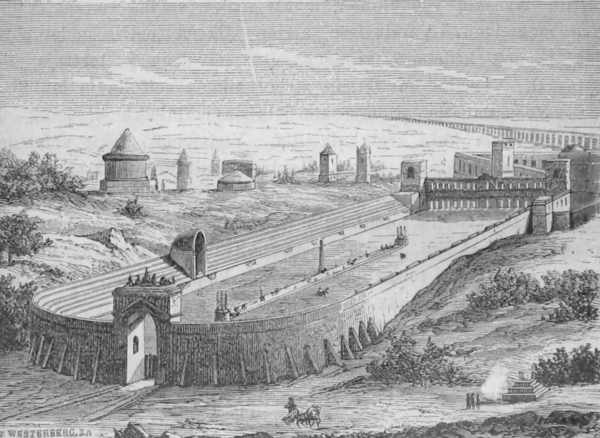 Because of the kind of political and economic situation in Rome that I’ve just described, there was a need for further stability and the need to build this second set of walls: again, the so-called Aurelian Walls. And the plan shows you how much further out they went than the Servian Walls, all the way to the Tiber River. It didn’t encompass the area across the Tiber, where Hadrian’s tomb, Hadrian’s mausoleum, the Castel Sant’Angelo is located, but for the most part it did cover the main of the city. And you can see, it went far enough out that it even encompassed some of the major city roads, or the beginnings of some of those major city roads. A view of the Aurelian Walls itself, very well preserved. They are named for the emperor Aurelian, who was emperor of Rome between 270 and 275 A.D. We believe that Aurelian began the walls, either in 270 or 271. They were not finished by his death in 275, and they were completed by his successor, a man by the name of Probus, P-r-o-b-u-s; Probus completed the Aurelian Walls, and dedicated them right after Aurelian’s death, in 275 A.D. The Aurelian Walls had a twelve-mile circuit around the city of Rome. They were originally 25 and one half feet tall, and there were eighteen major gateways in the Aurelian Walls; eighteen major gateways. I think you can see from this view on the right-hand side of the screen that the building materials were concrete faced with brick — brick-faced concrete. You see that very clearly here. And, of course, it’s important to keep in mind that that is different than what the original Republican walls were made out of. Those were made out of cut-stone, ashlar blocks. You see them in the section of the Servian Walls. 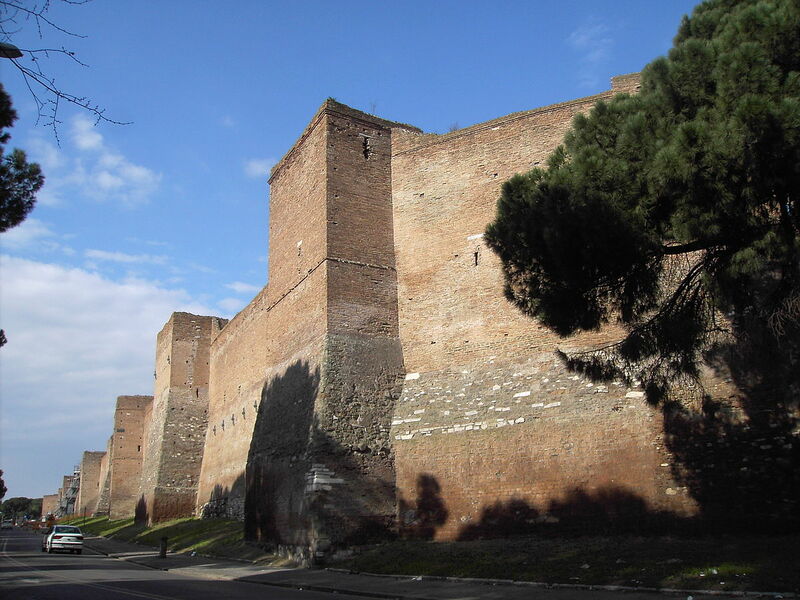 And here again the Aurelian Walls, with their up-to-date concrete faced with brick. But it’s a sign of the times that scholars who have examined these bricks have determined that they were not all new bricks, that many of them were re-used bricks from earlier periods, from the previous century in particular. And the reason for that probably has to do with the fact that again because there was so little architectural activity during this period there was simply no need to make bricks in large numbers, and when they needed them for this particular project, they reached back and used some that had been lying around of earlier manufacture. So I think again that underscores the incertitude of this particular period of time. What’s impressive about the Aurelian Walls is how much of them are preserved. 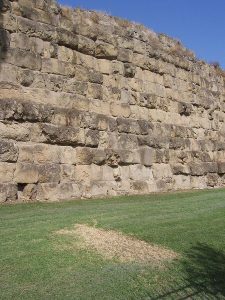 When I showed you the Servian Walls, we could only look at bits and pieces of those walls, preserved in different parts of Rome, especially near the Rome train station. 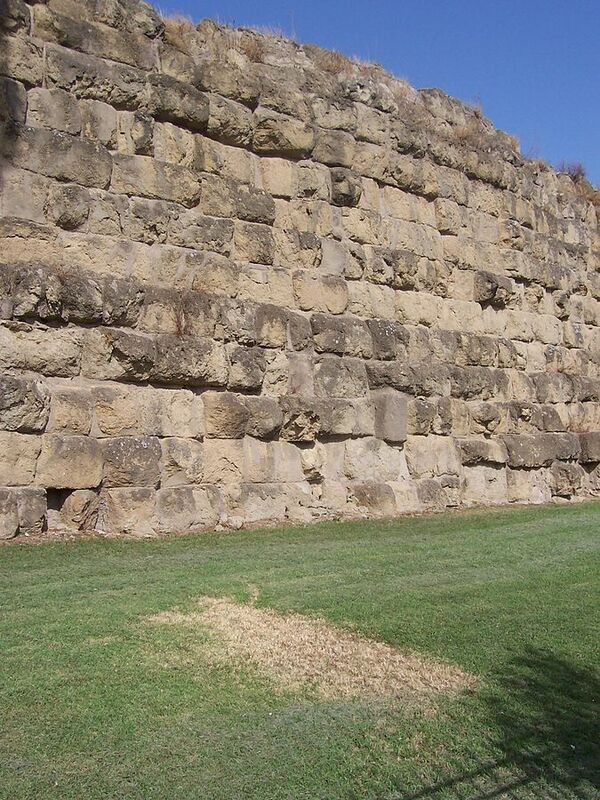 But in the case of the Aurelian Walls, we have a very large extent of those walls still preserved today, which is a tribute to how well they were built, that they have stood the test of time. And, in fact, when one visits Rome, when you come into Rome from Leonardo da Vinci Airport, the first things that you see of the city are the walls. 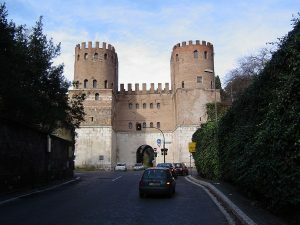 You go through those walls and it announces to you, of course, that you are in fact about to enter the city of Rome. I mentioned that the Aurelian Walls had eighteen gateways. Some of them are still preserved, and I want to show you one of them here, just to give you a sense of what these gateways were like. 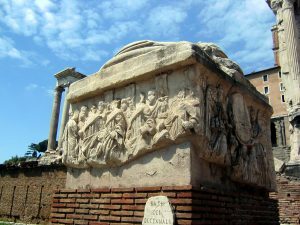 This is the so-called Porta Appia. 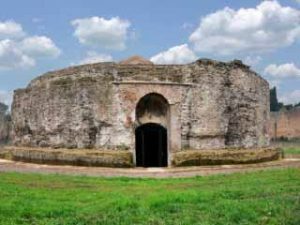 It also dates to the same time as the walls, 275 A.D.; called the Porta Appia because it is at the exact location of the Via Appia, or the Appian Way in Rome. The gate–I’m going to show you how the gate looked in the time, in 275, and then how it was altered somewhat later. You can see from the Monument List that although it was built originally in 275, it was restored by two Byzantine emperors by the name of Honorius and Arcadius, so this is in the post-Roman period, and they did that in A.D. 401 to 402. And the gate, as you see it today, is extremely well preserved, is the gate of the restoration of the fifth century A.D. In 275 it had two arcuated entranceways, as you can see well here. It had rounded towers, rounded towers. It had small windows with arcuations at the top, as you can also see, curvature at the top. What we see happening toward the end of the third century A.D. is the return of a centralized, of a strong, centralized government to Rome and to the Roman Empire, after the bloody third century A.D. and its numerous fly-by-night emperors, as I call them here. And the vehicle of this return of a stable government was the foundation of what we call the Tetrarchy; the Tetrarchy, which means literally four-man rule. The Tetrarchy was the brainchild of a man by the name of Diocletian. Diocletian was a Dalmatian; not a dog, but somebody who came from ancient Dalmatia, now Croatia, from Dalmatia. He was an imperial bodyguard who rose to great heights and eventually became emperor of Rome. He began his own rise to power in 283 A.D.; 283 A.D. But it was in 293, after ten years into trying to go it alone, that he realized that the Roman Empire had become much too vast for one man to be able to govern it alone, and he came up with this extraordinary idea to have four-man rule. We’ve seen co-emperors before, we’ve seen two-man rule–there was two-man rule initially with Marcus Aurelius and Lucius Versus, for example–but we have never before seen a four-man rule. But he felt that the Empire was sprawling enough that it really needed emperors in four different locations to enable the Empire to be governed and to enable stability to be returned. And that was the concept of the Tetrarchy, which again he founded in 293. 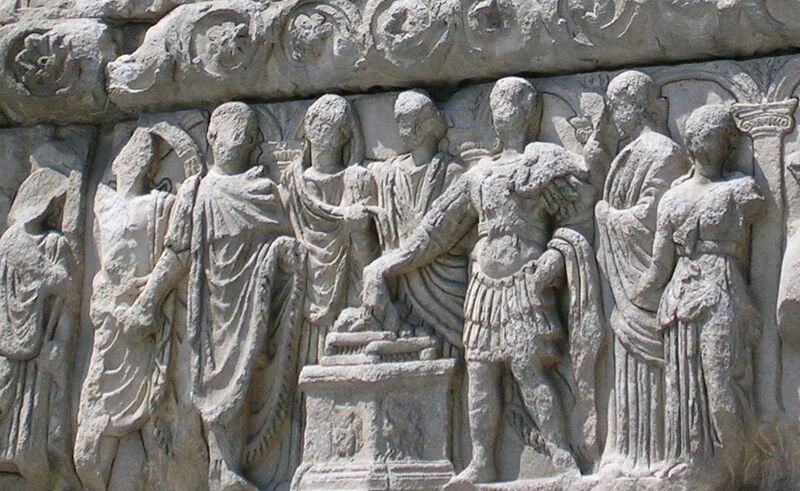 By founding the Tetrarchy, he made himself the main emperor, the Augustus, but the Augustus in the eastern part of the Empire, and I’m sure he chose that because of his own roots in Dalmatia, in again what is now Croatia. He chose a man by the name of Galerius to be his Caesar, to be his second-in-command, in the eastern part of the Empire. 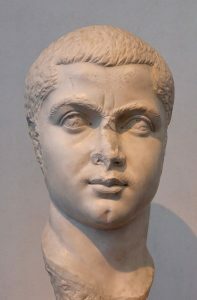 He selected Maximian, Maximian to be Augustus in the West, and then Constantius Chlorus to be the Caesar in the West: Constantius Chlorus, more well known as the father of Constantine the Great than he is as a Tetrarch, but he again, Constantius Chlorus, was the designated Caesar in the West. Order was restored through the vehicle of the Tetrarchy. And what that means for us, in this course on Roman Architecture, is that stability returned, stability that enabled major architectural commissions to once again be done, both in Rome and also around the provinces, and particularly in the provinces that these individuals made their capitals, in a sense, and where they lived, and where we’ll see they built their own palaces. So when we speak of tetrarchic architecture, I think we have to keep in mind that we are talking not just about the renovation of Rome–I mean, Rome itself, the renaissance, let’s call it that instead of renovation; the renaissance of Rome, Rome’s rebirth under the Tetrarchy and under Diocletian–but we are also talking about architecture, as we’ll see, that was put up in the provinces, also under the aegis of the Tetrarchs. 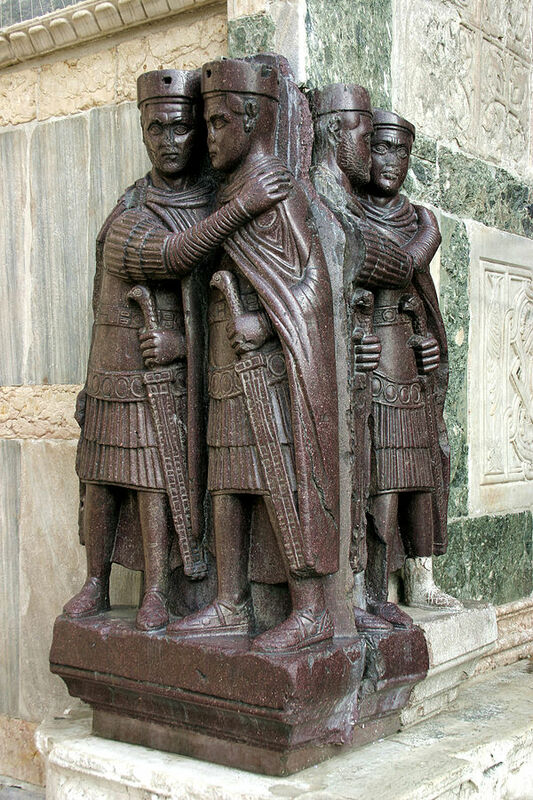 I want to just show you what the Tetrarchs looked like, and their portraiture is also illustrative of what their major architectural agenda was. 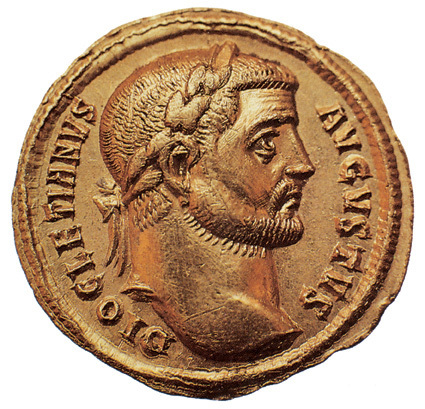 We see a coin portrait above of Diocletian, that gives his title, Augustus, as you can see here: a typical Roman coin profile portrait that shows him with a closely cropped military hairstyle and beard. But the much more–and he is represented this way in his coins, you know, from 283, the first decade from 283 to about 293. But the image that becomes the image of the Tetrarchs as a whole is the sort of thing that you see here. We begin to see, with the formation of the Tetrarchy, representations of them as a group. It’s sort of a one for all and all for one concept, that they are shown in mutual support, holding each other, in fact embracing each other, in mutual support as they try to re-stabilize the government. This is a wonderful group portrait of the four Tetrarchs. It’s done in this reddish-purplish stone that comes from Egypt called porphyry, and a stone that we’ll see used extensively in this period. This portrait is carved out of that. We have thoughts about where it might have come from, perhaps even Constantinople. But it ended up in Venice, and any of you who make your way to San Marco in Venice–it’s not immediately obvious where it is, but if you stand in front of San Marco, facing it, and go off a bit to the right, you will see this incredible porphyry group, hugging one corner of the building over here. And again you can see them–it’s done–what’s interesting to us, I think, is the fact that it’s done in a very geometric abstract style. It doesn’t look realistic. They are done–their proportions are stumpy and their bodies, their military costumes and their faces seem almost more like–and the hats that they wear, these Pannonian caps–seem almost more like geometric shapes than they seem like real clothing and the like. And that is part and parcel of a certain aesthetic that we see developing, this interest in geometric and abstract forms, that we see in portraiture. But we also see, which is important for us today, we see that in architecture as well, that interest. I think that the taste for that particular formulation has to do in part with this, the fact that they believe they have returned, or they’re trying to return stability to the government, so they choose these very solid, geometric, abstract forms to represent their images — be they portraiture or be they, as we’ll see, monumental works of architecture. 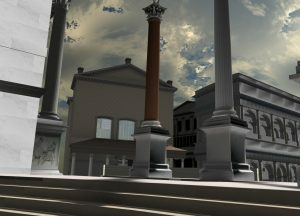 Perhaps it’s not surprising to see that when Diocletian begins to put up monumental architecture in Rome, he chooses first public monuments, public monuments that are going to be seen and that are going to speak to this return of stability to Rome, and he chooses to put them in as visible place as he possibly can. And what’s the most visible place in the city of Rome but the Roman Forum, the great Forum Romanum. So we see Diocletian commissioning a monument to put up in the Roman Forum. That monument is referred to by a variety of names. We usually call it the Decennial Monument. But it is also sometimes called the Five Column Monument, and it is sometimes called the Tetrarchic Monument. 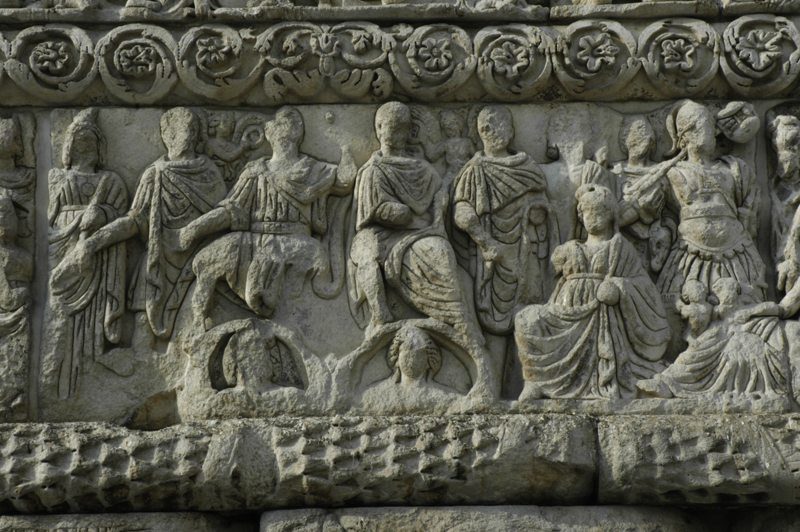 It’s called the Tetrarchic Monument because it honors the four Tetrarchs. It’s called the Five Column Monument because it’s made up, as we’ll see, of five columns. And it’s called the Decennial Monument because it honors the decennalia, the ten-year rule of the Tetrarchy; the Tetrarchy founded in 293, the monument is put up in 303, so ten years of rule. And it also honored the twentieth anniversary, the vicennalia of Diocletian, because Diocletian had become emperor in 283. So he’s lasted twenty years–which is extraordinary considering some emperors of the third century only lasted a matter of months–he’s lasted twenty years, and his Tetrarchy has lasted ten years. And it’s time for a celebration, and he puts up a major monument in the Roman Forum. 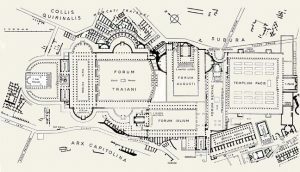 Let me show you via this map first, this plan of the Roman Forum as it would’ve looked between the third century and the seventh century A.D. We see a number of buildings that we have looked at together before. We can see in the uppermost part the Tabularium, the Temple of Vespasian. We see the Arch of Septimius Severus up here. We see some buildings we did not talk about; for example, the Temple of the Divine Julius Caesar, and a couple of basilicas that were put here in the late Republic and into–and finished in the Augustan period. Now the problem is that all we have left of this so-called Five Column Monument is a single base, one base of one of the columns. 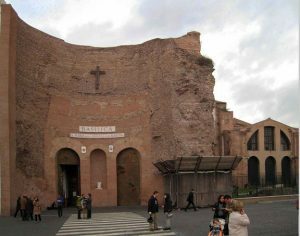 And you can see that base on display, right in front of, on a base, right–on a base, on a different base made out of brick, as you see here–the base of that one column, right in front of the Arch of Septimius Severus, dwarfed by the Arch of Septimius Severus. In fact, I’m always on the lookout when I’m in that part of the Forum to see if anybody looks at the column base, and nobody ever does, they’re so taken both with the Arch of Septimius Severus, with the Baroque church that lies behind and with the Curia or Senate House that we’re all going to look at today, that they don’t happen to notice this. But that is all that survives. So you might ask yourself, well then how in the world do we know there was a five column monument behind the Rostra, and that this is one of those columns? 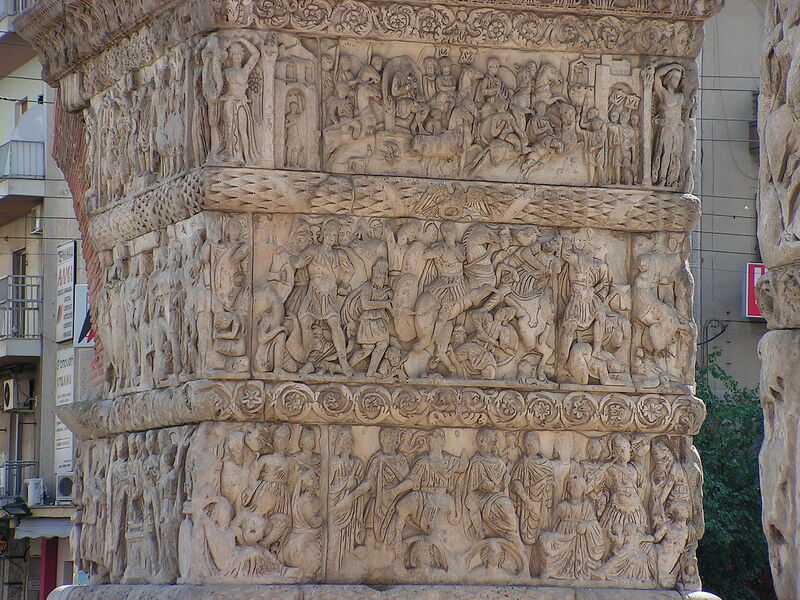 Because we have a depiction of it on the Arch of Constantine,the early fourth-century A.D. arch. One of the scenes that shows Constantine himself, is located in the Roman Forum, and we see Constantine, now headless, with some of his attendants and other individuals, standing on the Rostra, making an address to the people. He’s surrounded–this is very interesting, we’ll talk about why next time–surrounded by seated portraits of Hadrian and Marcus Aurelius, identifiable by their portraits, and he’s making an address. And if you look very carefully you will see behind him are five columns; five columns that have statues on top of them. That is the Five Column Monument that stood behind the Rostra. So that, combined with that preserved base, gives us a very good sense of what that monument might have looked like. Now you may be asking yourself, “What is she talking about, five columns? There are only four Tetrarchs. Is she misspeaking here?” No, I’m speaking correctly, there were five columns, but one of those columns was put up to Jupiter, Jupiter: the head god, Jupiter who was the patron god of Diocletian. 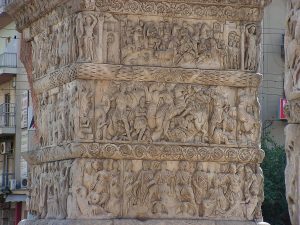 So we see Jupiter in one column on his own, back behind the others, and then the other four columns of the Tetrarchs, each with a base with sculptural figural decoration down below. The shaft was plain, and then a statue of each of the four Tetrarchs and a statue of Jupiter on the top. And we think that the column and statue of Jupiter were probably a little bit taller, as is indicated here, because he was after all a god, than the others. I want to show you quickly, because this is again, of course, in architecture and not in sculpture, but I do want to show you just quickly the scenes on the base. Because I think one of the interesting detective work one can do is to try to figure out, since we have only one base, whose base was it, which of the four Tetrarchs, or was it Jupiter’s base? And I’ve played that game myself, and I’ll give you my idea, and you’ll see whether you think it’s a good one or not. We look at the scene at the top uppermost part – we’re looking at the four sides of that sculptured base. 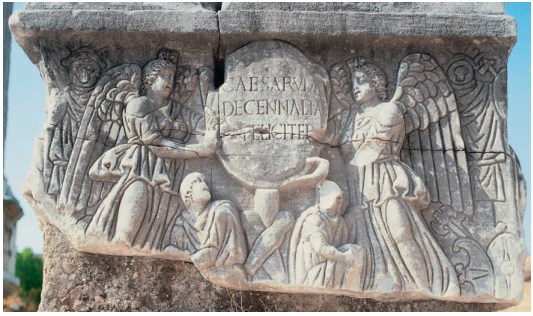 At the top you see two victories, with a shield, and that shield has the word in the center, decennalia: that’s how we know it’s dedicated to the decennial anniversary, ten-year rule, of the Tetrarchs. You can also see barbarians down below, so a reference to those who have been conquered. And if you look very carefully, you’ll see that the figures are outlined in the way that we saw them at Orange and also at St. Rémy. And then some of the items, including the arms and armor, are actually inscribed, carved, on the stone, directly on the stone. So this very interesting use of outlining here. Here I don’t think the reason for it is the same. I don’t think they’re looking at copy books, but rather that there has been–there’s now an interest in this kind of outlining for visual effect. 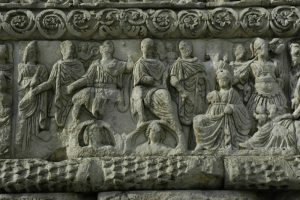 Up here we see a sacrifice of three animals being brought in for sacrifice, and the men with their axes who are going to slit their throats ultimately — the sacrifice obviously in honor of this decennial celebration, this anniversary celebration, making reference to ten-year rule of the Tetrarchy. Here’s a scene down here–unfortunately, in all of these scenes where we seem to have the emperor or emperors, the heads are no longer preserved. So here we have a sacrifice scene, also a sacrifice being made in honor of this decennial anniversary, but the emperor, represented here, who was sacrificing, whose base this probably was, his face is gone. 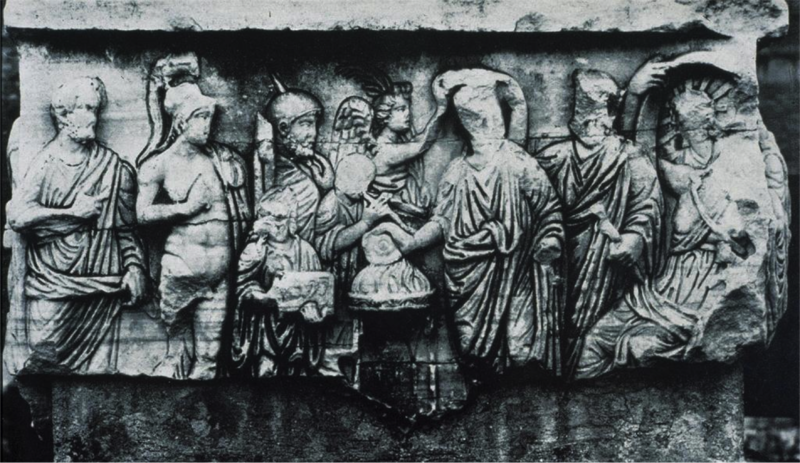 But you can see he’s accompanied by Roma, by the Senate, the personification of the Senate, by Mars, by Victory, who crowns him with a wreath, as you can see here. And this looks like a figure of Sol Helios, with the rayed crown. So a whole panoply of divinities by whom he is being honored and with whom he wants to associate himself. This is the most important relief, I believe, in terms of speculating about whose base this might have been. We see four figures, four adult males, in the foreground, with togas, all of them headless unfortunately. But four of them–that’s no coincidence, all four standing there. So while we see one of them–this is his base–one of them sacrificing here; I guess one could argue it’s Diocletian as the head of the Tetrarchy, that would be another possibility. But the four of them represented here. But if you look very closely, one of them is accompanied by a child. So my speculation would be since one of them is accompanied by a child, and since it is Constantine who was thought most likely to be the one to eventually succeed the Tetrarchs, or become a Tetrarch himself, I would speculate–and this is pure speculation–that this may have been the base of Constantius Chlorus, of his father Constantius Chlorus, and that the clue there is Constantine. Another building that Diocletian was interested in, in the Roman Forum, in terms of associating himself with Caesar and also with Augustus, was the Senate House. The Curia Julia it is called, the Curia Julia: because it was actually not built in the Diocletianic period, but built initially–begun by Caesar, begun by Julius Caesar to provide Rome with a Senate House in the Roman Forum — begun by Caesar and completed by Augustus after Caesar’s death. 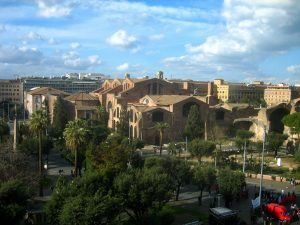 But the building was–and that’s why it’s named Curia Julia after the Julian family, that Caesar, and also Augustus, were a part of. 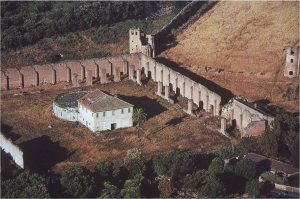 But that building, the Curia Julia, was destroyed, very seriously destroyed, in a fire in Rome in 283 A.D. And so what Diocletian does is he restores it between 284–he begins already in 284, well before the formation of the Tetrarchy, and he completes it in 305 A.D.; this restoration. 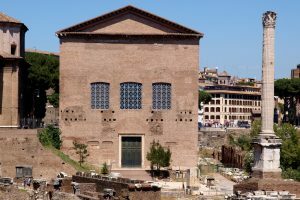 It continues to be called the Curia Julia, but it is at this point a Diocletianic building, but one that clearly–where he instructed his designers to try to keep it as close to the original as possible. Now what you’re looking at here on the right-hand side of the screen is a coin that comes from the period of the emperor Augustus, and it purports to represent–I don’t think there’s any question that it represents, given its inscription and so on–the Senate House in Rome, as it would have looked as completed by Augustus, and he’s in fact celebrating the completion of this monument, and associating himself, through this coin, with his divine adoptive father, Julius Caesar. If we look at the form–if we look at the exterior of this monument, as it is depicted on the coin, you will see that it is a regular square, the front of the building looks like a square, with a very large pediment at the top, although I think that was accentuated here, its size, in order to allow the die cutter to include the sculpture in the pediment, and also the sculpture decorating the eaves. We see the doorway right here. We see there seems to be a triple window, up above the doorway. And if you look very carefully you will see that there seems to be a portico, a series of columns, that are there to relive the severity of the otherwise very geometrically ordered façade. 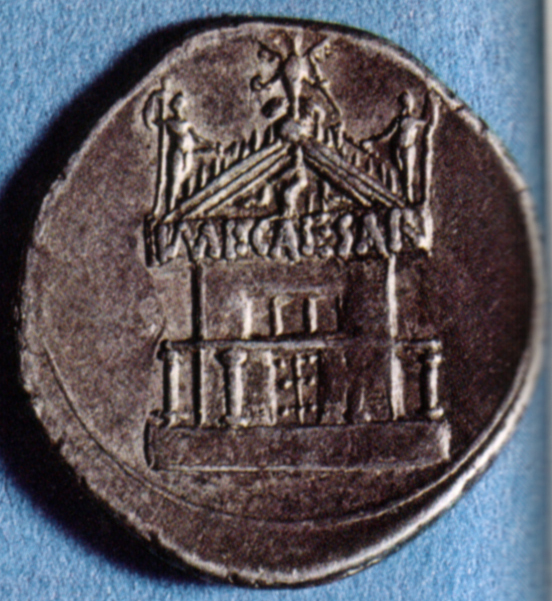 So that’s what we think it looked like in the time of Caesar, based on that coin. You see it over here in plan. 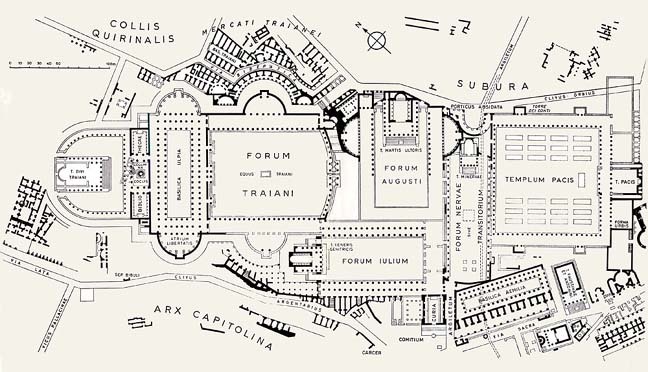 This is a plan of the forum in Rome, in the Augustan period, 10 A.D. We see the buildings that were there at that time: the basilicas; the Temple of Divine Julius Caesar; the Rostra, but of course without the Five Column Monument; no Arch of Septimius Severus. But we do see the Curia. And you see it here in plan as a very plain, open, rectangular box, in a sense. So even in its Caesarian and Augustan beginnings, it seems to have been a very straightforward, matter-of-fact kind of a building. 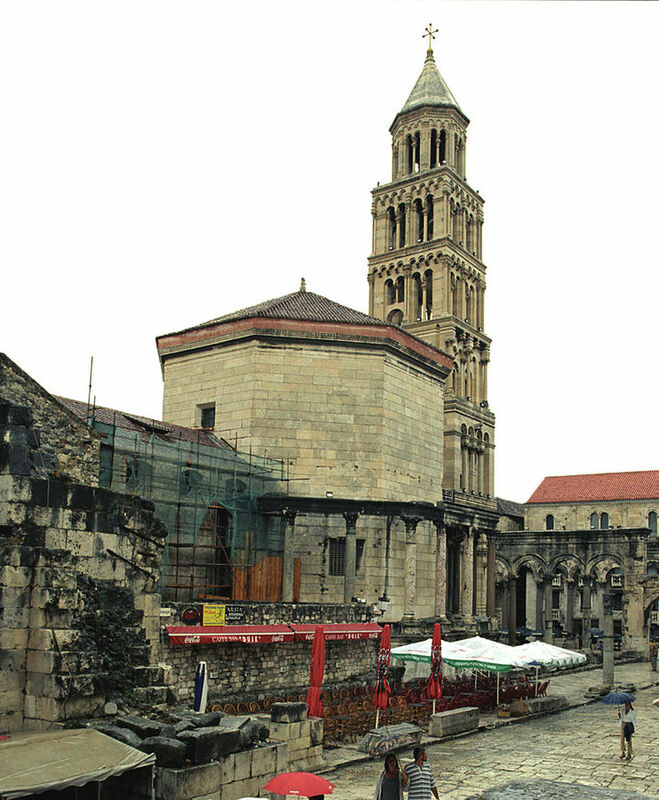 This is a restored view of what we believe it looked like after the restoration by Diocletian. You won’t be surprised to hear that the materials were different, that it’s a building–in its restored version it was made out of concrete faced with brick, exposed brick. So very much a building of its own time. It would not have looked like that in the time of Caesar and Augustus. But they have, in every other way, they have kept to the underlying geometry of the form, to the use of the triple window with a curved top, as you can see here an arcuated top, a pediment up above. We don’t know whether the second version had pedimental sculpture in it, or other decorative sculpture. The doorway down below. But the severity of the brick-faced, the exposed brick façade has been alleviated somewhat by the placement of marble revetment at the bottom part of the wall, behind a series of columns. So they have kept that portico, that set of columns, to relive the severity, but also to make this building look, as much as they could, like the original Caesarian and Augustan structure. This is what the Curia looks like today. It is extremely well preserved, as you can see. Yes, it’s lacking its marble revetment, and it’s lacking its portico. But in every other way you can see very well exactly what this building looked like in the time of Diocletian: concrete faced with brick, with the very simple windows, and this very geometric, abstract ordering. Which again I believe–you know, I think the explanation for that is twofold: one, that they are trying to maintain the look of the original Julian building, but also because this is again the aesthetic of the time, this decision to make buildings in a very geometrically ordered, abstract way; I believe again to reflect the stability of their new government. This building, the Curia Julia, owes its excellent condition to the fact that it, like so many buildings, was reused over time. 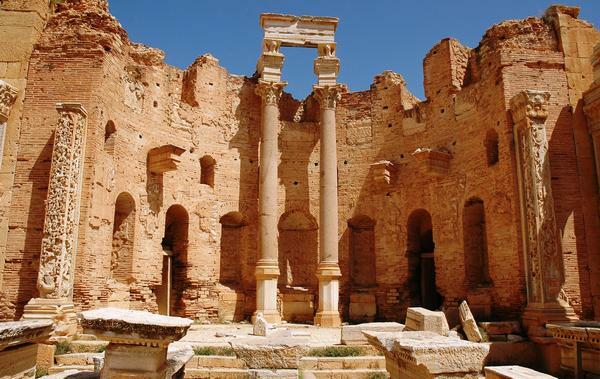 We know that it was turned into a church already in the seventh century B.C. ; that it was restored in the twelfth and in the sixteen century A.D.–did I say seventh century B.C.? If I did, I meant A.D.; seventh century A.D.; twelfth and sixteenth centuries, and then again in the seventeenth century. And it was in the seventeenth century that it, like so many other Roman structures, was transformed into a Baroque church by an architect by the name of Martino Longhi the Younger–I’ve put his name on the Monument List for you, Martino Longhi the Younger–and it was re-consecrated as San’Adriano, Saint Hadrian, al Foro Romano, San’Adriano al Foro Romano, Saint Hadrian in the Roman Forum was the church. And when I say Baroque church, I mean a Baroque church. It was deconsecrated by Mussolini in the 1930s, Mussolini returning it to its original ancient form, as you can see over here. But this photograph shows the work that was being done in the ’30s to dismantle this Baroque church into which the Curia had become. 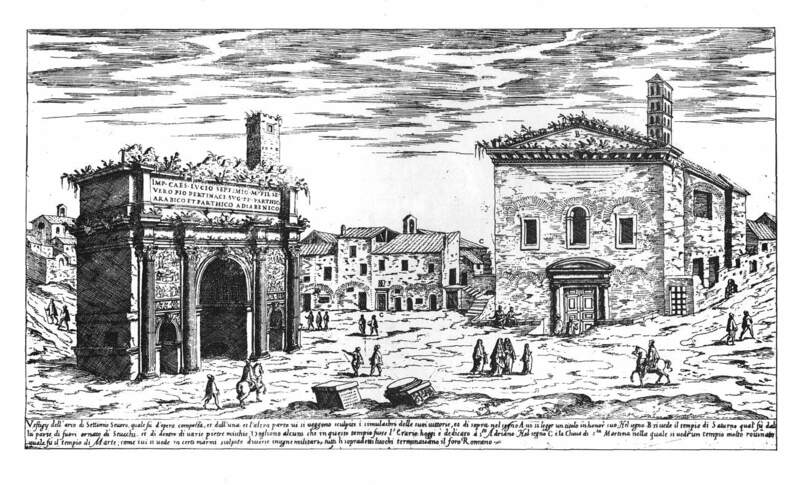 I mean, it’s really hard to believe that this was the Curia in the seventeenth century, but that’s exactly what it looked like, as well as in the early twentieth century. And you can see a bell-tower had been added, buttresses had been added to the structure, completely encasing the Curia in a Baroque church. And we see that being dismantled in this view over here. And I have a view I can show you also of the interior. 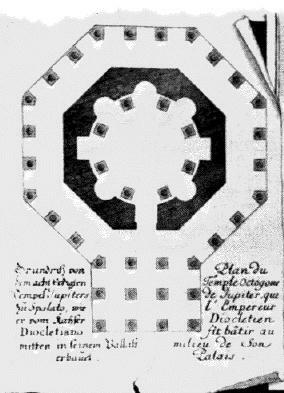 This was the interior in the seventeenth century; impossible to see that original simple box-like interior that was there in the time of Diocletian, and probably there in the time of Caesar and Augustus, so filled is it with the usual Baroque paraphernalia of elaborate stucco work and angels flying to the skies and these–not that we haven’t seen this kind of thing in Roman architecture, we of course have. 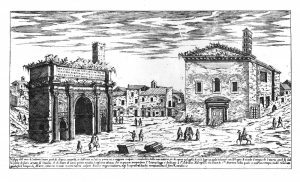 But you can see that the original shape of this particular building has been completely disguised by Martino Longhi the Younger as he redoes the Curia as a Baroque church. You can see from this view this very simple, box-like shape for the interior of this structure: plain walls; a coffered, a flat coffered ceiling; the only light brought in by a series of very simple windows, with arcuated tops, allowing light into the system. And then down below–again the brick facing, the concrete and brick facing exposed–but with the down below probably some marble revetment on the wall down here. Very simple niches, arcuated and rectangular niches, but very, very simple ones. Down below the original marble revetted floor is still preserved. And I can show you two views here, in color, of that floor, to give you a sense–all done in marbles, marbles brought from different parts of the world. 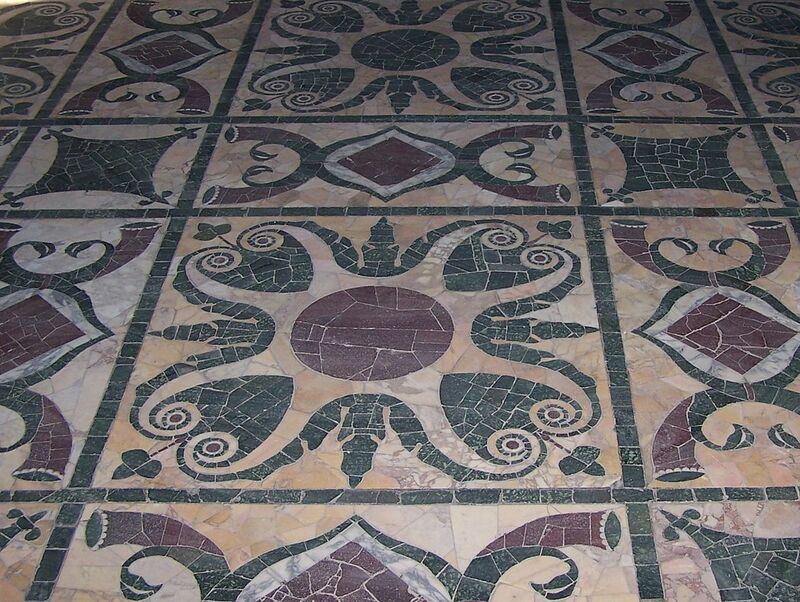 But the usual colors that the Romans liked for most of their marble pavements, a white or off-white, maroon, green and black, but very nicely done for this–very simple, very geometrically ordered, but very beautiful interior. 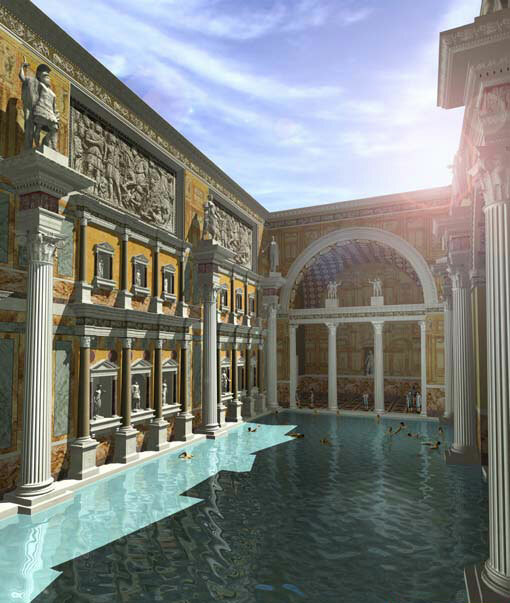 With regard to public architecture, Diocletian also built a major bath in Rome, following the lead of Caracalla and many emperors before him, to provide for the Roman people a place where they could go and enjoy themselves, as well as learn. Because you’ll remember that by this time these major imperial bath structures–and this is one of those–placed the bathing block inside a much larger precinct, that included rooms around it that served as lecture halls and meeting halls and seminar rooms and places for Greek and Latin libraries and the like, and we see that same scheme being used here. 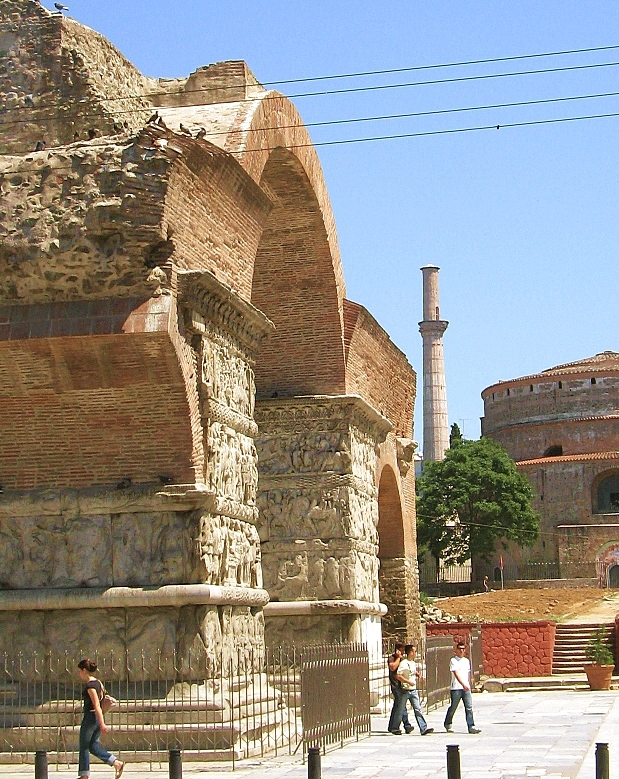 The baths were built between A.D. 298 and 306 by Diocletian in Rome. They’re located near the train station today; so very close to those remaining fragments of the Servian Walls. And you see again that plan here. And you see that the outer precinct has one of these large hemicycles that may have been used for performances, as you can see, and that it is like the other imperial baths that we’ve looked at, with the central bathing rooms in the center, in axial relationship to one another, and in the usual sequence, and then with other rooms disposed around them on either side, in a symmetrical way. We see at Number 4 the natatio or swimming pool. We see–which has a scalloped, the bottom side, as you see it here, is scalloped, the wall is. 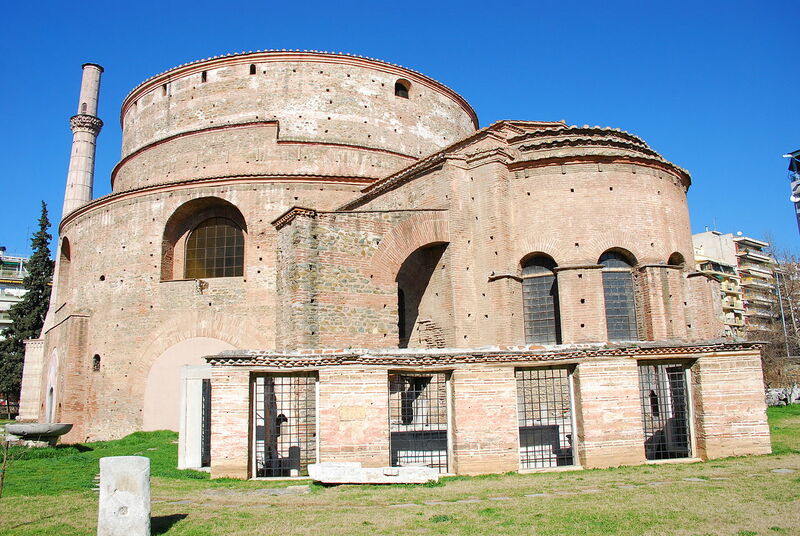 Number 3 is the frigidarium, the cold room of the baths, which had a triple groin vaulted ceiling. 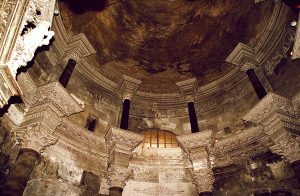 From there we go into the tepidarium; you see it here, a small circular structure with radiating arms that give it a cross shape. 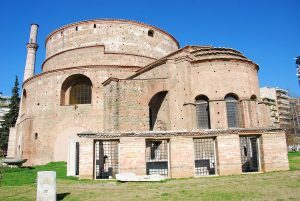 And then down below a very interesting caldarium, because we see that Diocletian and his architects have rejected the round caldarium, with the radiating alcoves, looking so much like the Pantheon, as we discussed, and almost as large, from the Baths of Caracalla. They’ve rejected that in favor of a more rectangular shape, that’s more similar to the shape of the frigidarium, but with radiating apses that have a series of columns that allow views and vistas from one to the other. 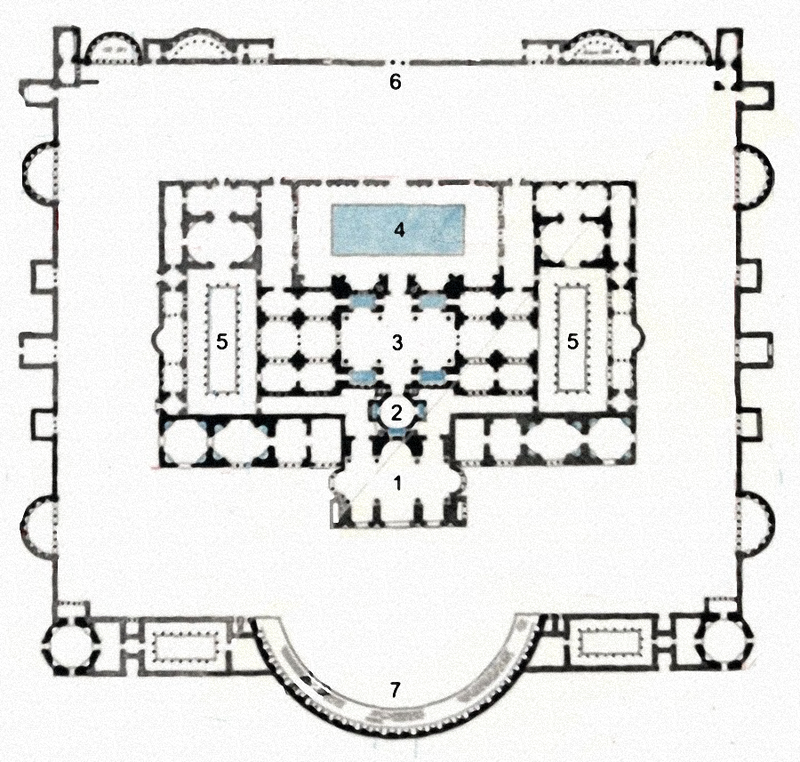 This is another version of the same plan, from Ward-Perkins in this particular case that shows again the natatio, the frigidarium. Here you can see better the way in which the circle becomes a cross shape for the tepidarium; and then here the caldarium below, where you can also see better, I believe, the columns on those alcoves that allow views, both from inside out and outside in. And here still another one. This is the one that you have on your Monument List that shows you those spaces, once again from the other direction. 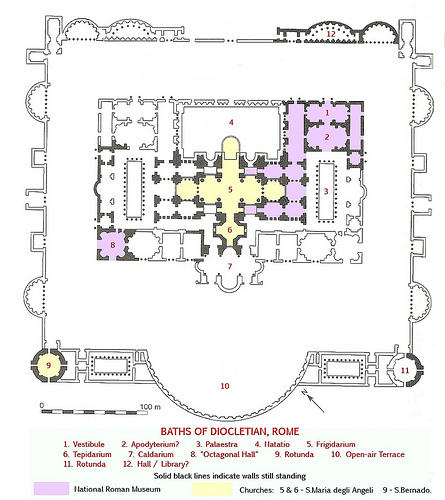 The natatio, where you can see very well the scalloped wall; the frigidarium, where you can see the triple-groin vault; the tepidarium with its round shape and radiating arms; and then most importantly the caldarium with probably also triple groin vaulted, just like the frigidarium, but with radiating alcoves; and then all of these other rooms disposed among them symmetrically. Now what’s very interesting also, in terms of more architecture in later times, is the Baths of Diocletian were also reused, but in this case not for a single building but for a variety of buildings, including a major museum of antiquities, a planetarium, and also a church, the famous Church of Santa Maria degli Angeli, Saint Mary of the Angels. 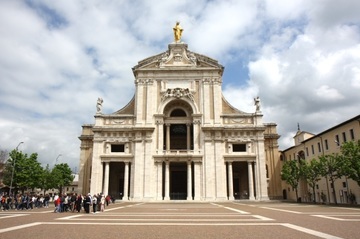 When the Church of Santa Maria degli Angeli was redesigned–and one of the redesigners, by the way, was Michelangelo–they took the alcove–the bottom alcove of the caldarium–they used that as the curved façade of their church. 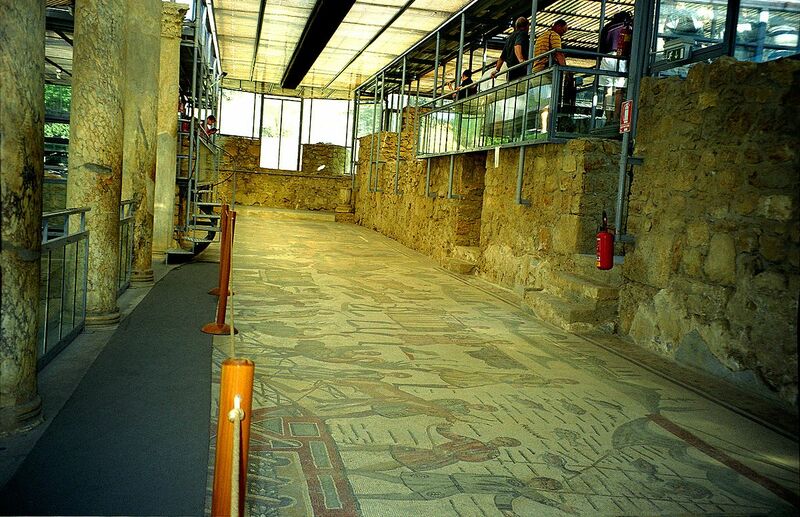 They used the tepidarium as the vestibule. 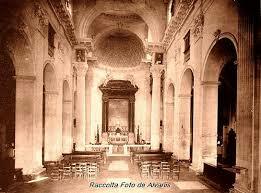 They used the frigidarium as the main space of the church. So that becomes the church, that main, the bottom part of the caldarium, the tepidarium, and the frigidarium become the church. And then some of these other spaces are used again for other kinds of buildings, including a planetarium. 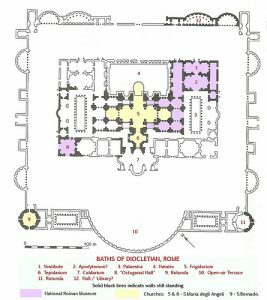 I call your attention especially to the ones at the upper right and the upper left, both of which are octagonal spaces, as you can see comparable to earlier octagonal spaces under Nero or under Domitian. 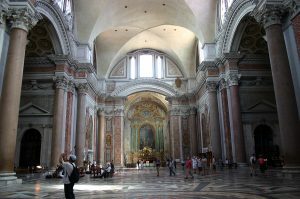 Above is a view into the church, into the nave of Santa Maria degli Angeli, which again what you’re looking at is the original frigidarium of the Baths of Diocletian. You can see all the things one usually sees in a frigidarium, and I show you a restored view of what we think the frigidarium of the Baths of Diocletian looked like in antiquity. And you can see there’s a close resemblance between the two. The groin vaults are still preserved. 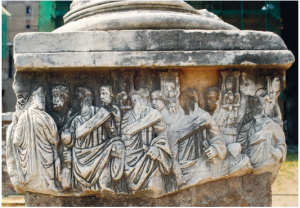 We see original columns here, granite columns, with capitals–some of the capitals are ancient, some of them are not–and we see a lot of color, just as we would’ve seen in the original Baths of Diocletian. 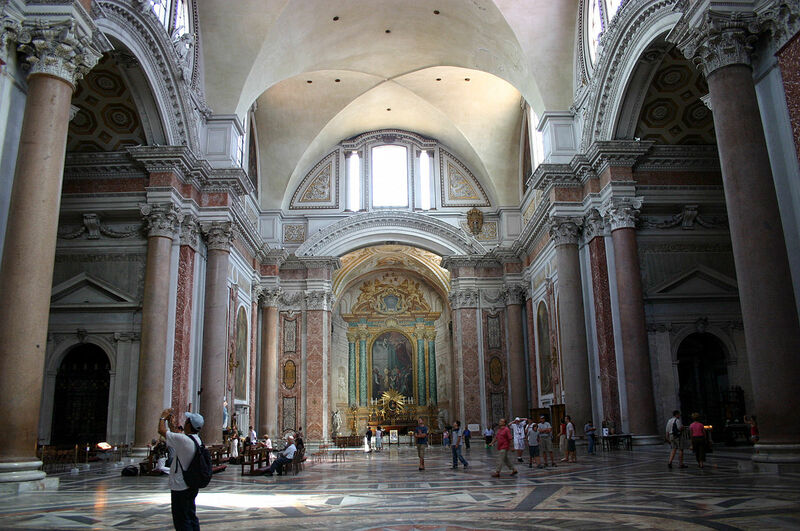 One difference is that we see the groin vaults in the Santa Maria degli Angeli are white, and that is the work of Michelangelo. 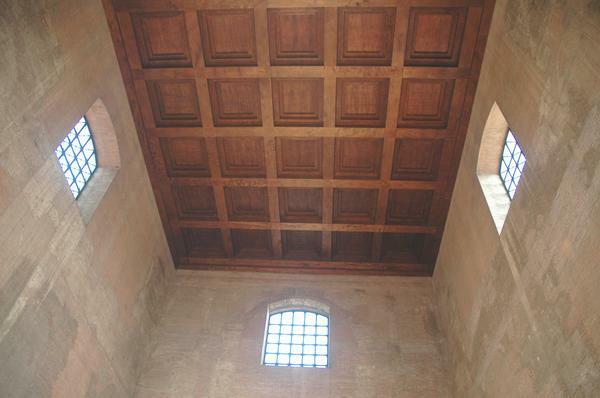 Michelangelo decided that he wanted something much plainer for the vaulting of Santa Maria degli Angeli, and it was he who stuccoed it over, and no one ever dared to change Michelangelo’s work. But another architect by the name of Luigi Vanvitelli, was at work in the Santa Maria degli Angeli interior, in the eighteenth century; precisely in 1749. 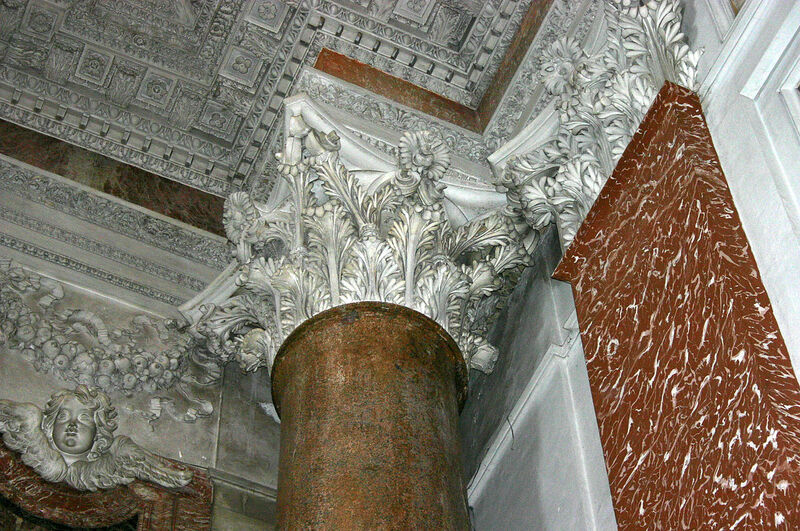 He came in to spruce up the decoration, and it was Vanvitelli who added to the original Roman granite columns, who added these mottled–you see these mottled pilasters; I’ll show you a detail of them in a moment with their capitals–some new capitals to match the ancient Roman capitals. He added a lot of the stucco decoration that you see here now, and a lot of the altarpieces were put in, in the seventeenth and eighteenth century, to make it the church that it needed to become. But if I show you a detail of Vanvitelli’s work, you can see–you know, as you stand in Santa Maria degli Angeli, one tries to figure out what’s ancient and what is modern–but you can see here what seems to be a granite shaft, from an ancient column, with a new Corinthian capital, designed by Vanvitelli, that imitates those, the Roman ones that are there. But all of this mottled work, and all of the stucco decoration that you see over here, added by Vanvitelli in the eighteenth century. But you’ve seen enough Roman, ancient Roman architecture, especially of the baroque kind, to know that this sort of thing did exist in Roman times. And I think Vanvitelli has actually done a pretty good job of giving us a sense of what the figidarium of these baths would have looked like in the time of Diocletian. 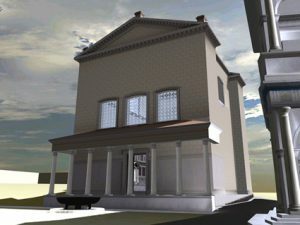 Now here’s the façade, and so you see exactly what I described before. This is one of the alcoves. You can see the concrete brick-faced alcove that they have–I mean, this is the simplest façade of any in Rome. There’s nothing quite like this. But it’s so typical of the Italians to take wonderful advantage of what there is. And so in this case they decided best to leave it as it is; it speaks for itself. They just use that alcove. 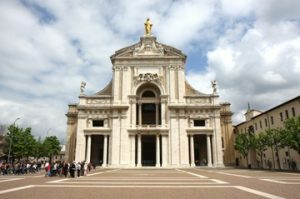 They added a couple of doors, created a niche, slapped the name, Basilica Santa Maria degli Angeli, on the front, very simply, put a cross at the top, and this became the façade into the church, and it has remained this, to this day. 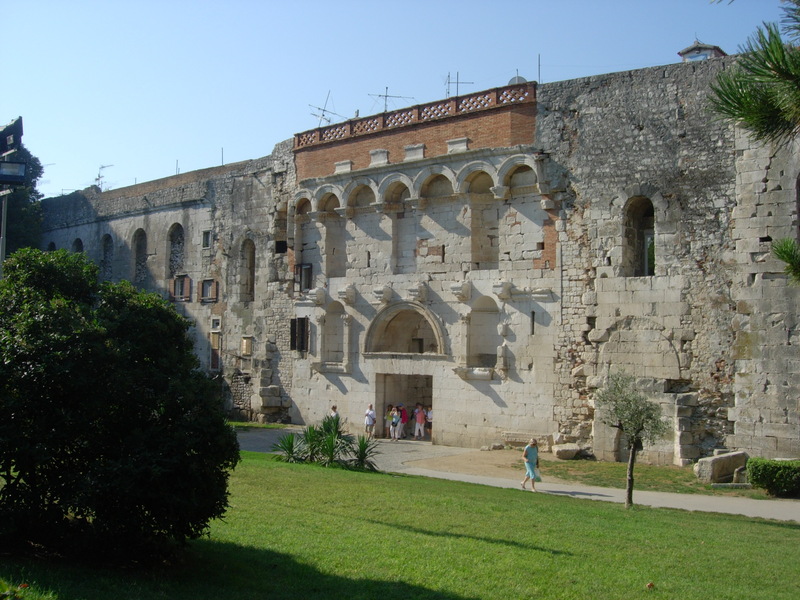 Here’s another view of the Baths of Diocletian, as they look today. 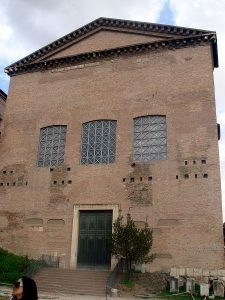 We’re looking at the outside, where we can see the outside of the frigidarium, with its windows and its groin vaulting exposed on the outside. This is the tepidarium, and the roofing of the tepidarium. And over here you can see the curved façade that’s–the part of the caldarium that survives uses the façade of the church. You can see one of those octagonal rooms looks like today. And what they’ve done, they’ve taken advantage–this is a spectacular space. This was just–we don’t know exactly what purpose this served in the bath originally, but it’s actually a space that’s more similar to the caldarium of Caracalla’s Baths than it is to anything else in the Baths of Diocletian. 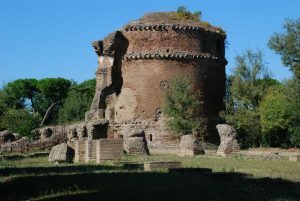 But you can see that they have taken advantage of this extraordinary octagonal shape, with radiating alcoves, going back to Nero’s Domus Transitoria, Domus Aurea, to use as a place to display some of the greatest works of sculpture in the part of these baths that now serves as a museum. One very interesting feature though that I want to point out to you is the fact that you do see them using here windows in the lower part of the dome: windows, arcuated windows, to allow light into the system. We see this development in late antiquity where they move from providing light through the oculus to providing light through a series of windows. And again they’re sophisticated enough in their use of concrete to be able to do that, and we see that’s a trend. 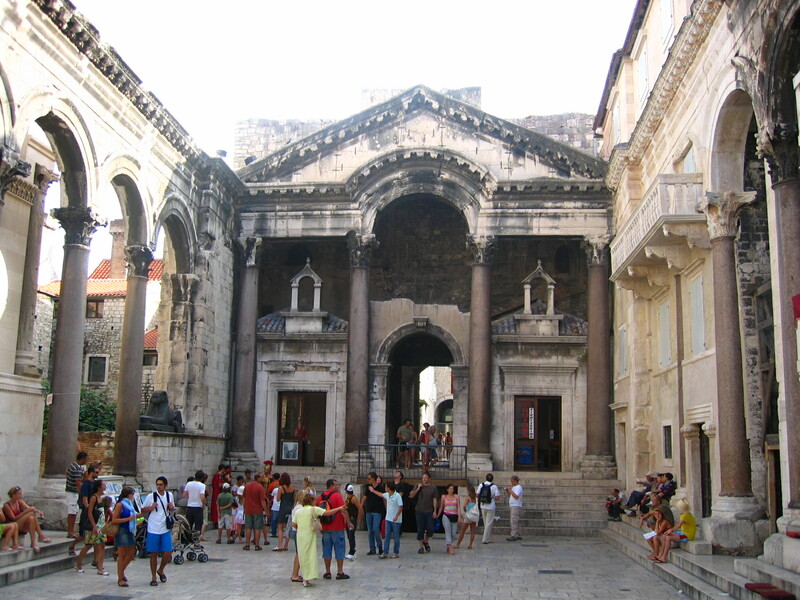 Diocletian was as interested in private architecture as he was in public architecture. He was a man–you can tell a lot about him just from what I’ve told you. 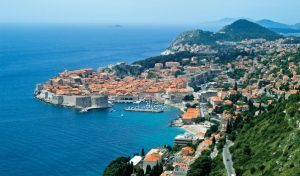 He was very organized and he planned ahead for his own abdication eventually, his own retirement, and he wanted to live ultimately back where his roots were, on the Croatian, on the Dalmatian Coast. It’s magnificently beautiful there, and one can imagine why Diocletian was drawn to return to his homeland for his palace. So we are looking here at the plan of the Palace of Diocletian, which is extremely well preserved. And you should be immediately struck by this palace, because it–which dates, by the way, to 300 to 305 A.D. We see here something that I’m sure you’ve all noticed already, and that is that he has built this palace in the form of a Roman castrum; it’s a Roman military camp. It is a little city; it’s a city in its own right, in the form of a Roman military camp. Why did he do that? That’s interesting. Well I think it had something to do with the fact that the structure was located on the sea, right on a promontory on the sea, and could easily have been attacked. 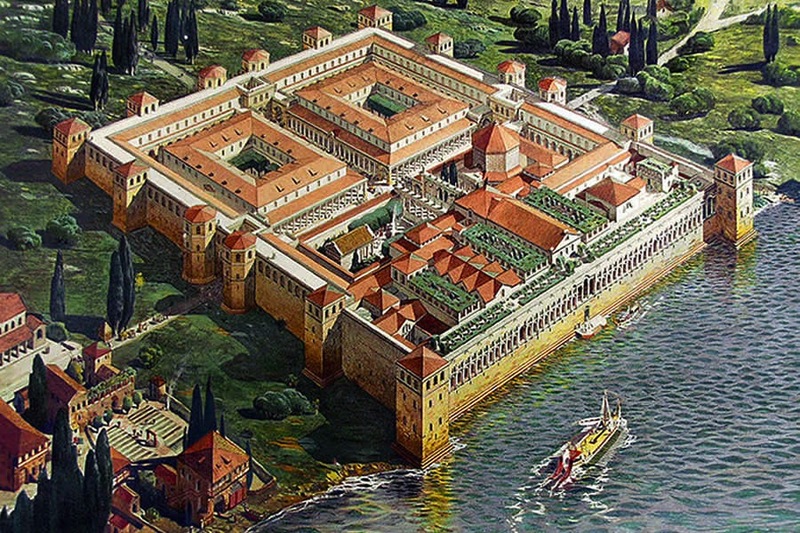 And times were still–he was still–he had brought stability back, yes, but he was very aware of what had preceded him, in the third century, and desirous of protecting himself and his possessions in his palace, on the Dalmatian Coast, and so he builds it in the form of a castrum. You can see all the elements of a typical Roman military camp, just as we saw in city building, urban planning, from the Republic on. It’s rectangular in shape. It has walls. It has watchtowers; you can see they are alternately rectangular and octagonal watchtowers. It has entrances and exits. 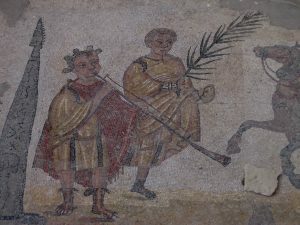 It has a cardo and a decumanus that cross at the intersection of the palace. You can see there are–the main gateway is on the northern side; the southern side faces the sea. 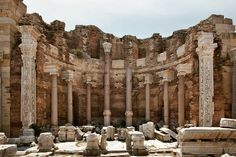 As you walk from the northern entranceway, along the cardo and the decumanus, so to speak, of this palace, you will see that they are colonnaded, just as they usually are in the eastern part of the Empire, but not in the western part of the Empire. As you walk along from the entranceway, you enter into a public court over here, very elaborate, that’s still preserved, with an arcuated lintel; I’m going to show you that in a moment. Then into this domed area here, with alcoves. 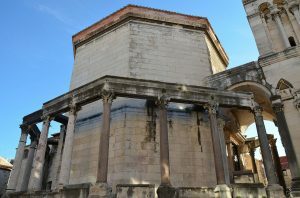 But note that on either side of this open space, with the arcuated lintel, which is called the peristyle of the villa, you can see on one side a small temple, which is a temple to Jupiter, the patron god of Diocletian, and on the other side a mausoleum, an octagonal tomb. Now that should strike you as very interesting and very unusual. 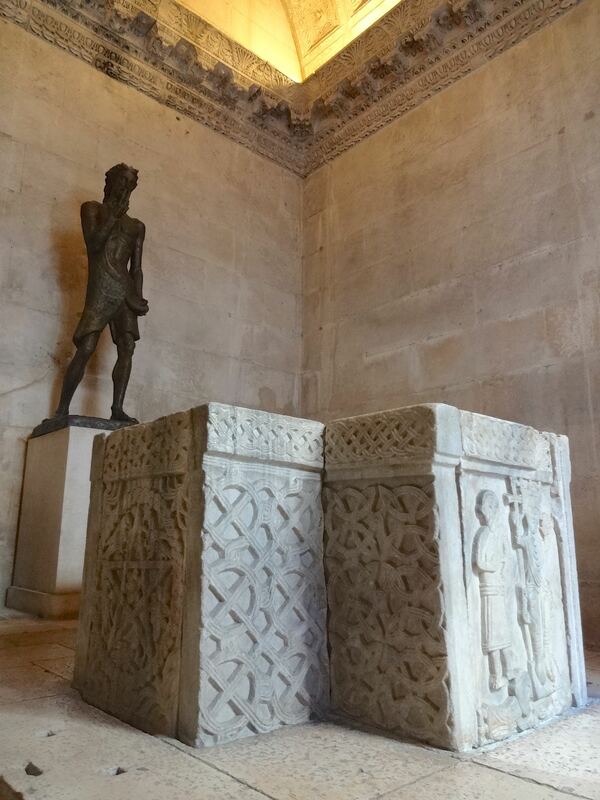 We have not seen a tomb as part of palace architecture before. This is new, to late antiquity. This probably has to do in part with again Diocletian planning this as his place of retirement. He knew he was going to retire there, he knew he was going to die there, and he wanted to make sure that he supplied for himself a tomb–he was not going to be buried in one of these major mausolea in Rome; he wanted to be buried at home, and so he plans for this by building an octagonal–not a round, like Augustus and Hadrian–but an octagonal tomb, with a porch here in the villa. And note that it is right across from the Temple of Jupiter; no coincidence there. Go through the domed room, domed space, into the private wing of the house. You see a room here with a basilican shape. We’re not exactly sure what it was used for, but probably some kind of reception hall. 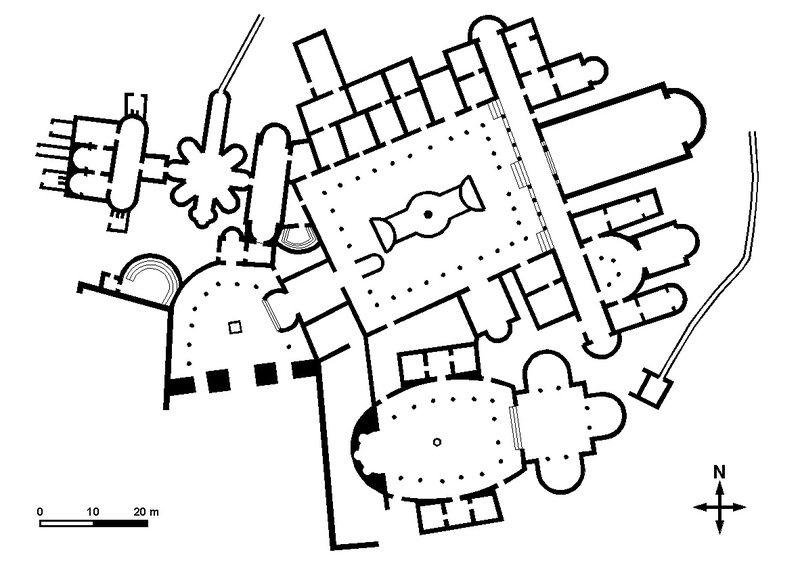 And then here a series of interestingly shaped rooms, that was where the emperor’s private quarters were located. 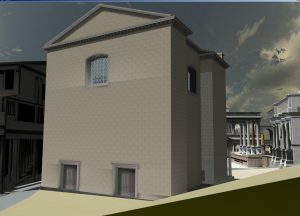 This is a restored view of what this fortressed palace would have looked like, when it was built in the fourth century. We see here all of the things I’ve already described: the outer walls; the watchtowers; the entranceway on the north; the colonnaded streets. You can see the octagonal tomb rising up over there, across from the Temple of Jupiter; and then down here the private area, the private wing. And you can see how the southern side faces the sea, and there seems to have been an arcuated lintel on that side. We’ve seen that that’s grown in influence and importance since it was first used in the time of Hadrian. This is the Porta Aurea, or the northern gate of the palace. Rectangular entranceway, lintel, window-like, with grates above; niches on either side, with arcuated pediments. But most interestingly is the upper tier where you see a series of columns on brackets that support arcades. This whole idea of arcades on columns began, as we know, later in antiquity, and continues to be important into the late third and early fourth centuries. We saw it at the Severan Forum at Leptis Magna, where you can see again columns, this arcaded colonnade here. 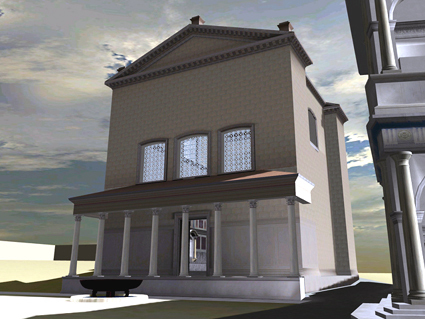 We saw it in residential architecture at Ostia, late residential architecture. Think of the House of Fortuna Annonaria where we have those columns with arches above them that separate the fountain court from the triclinium. 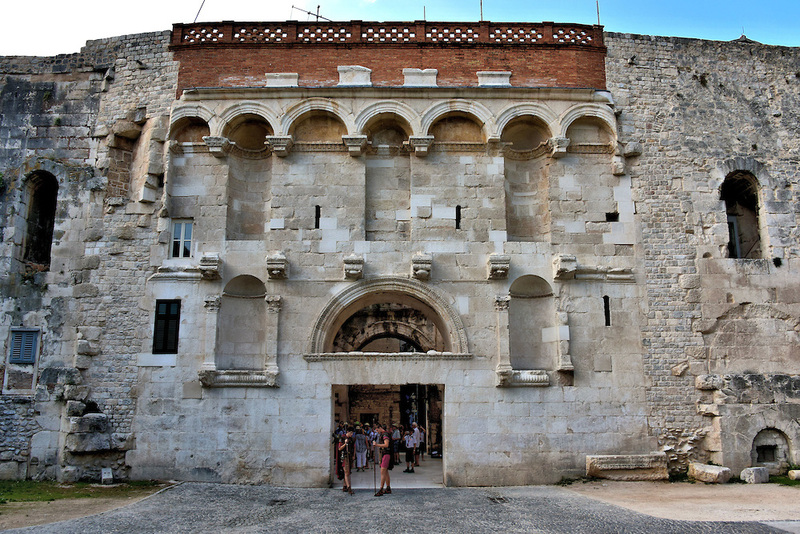 So I just wanted to make the point that we see it not only at Diocletian’s Palace, but it’s very common in late Roman residential and civic architecture as well. 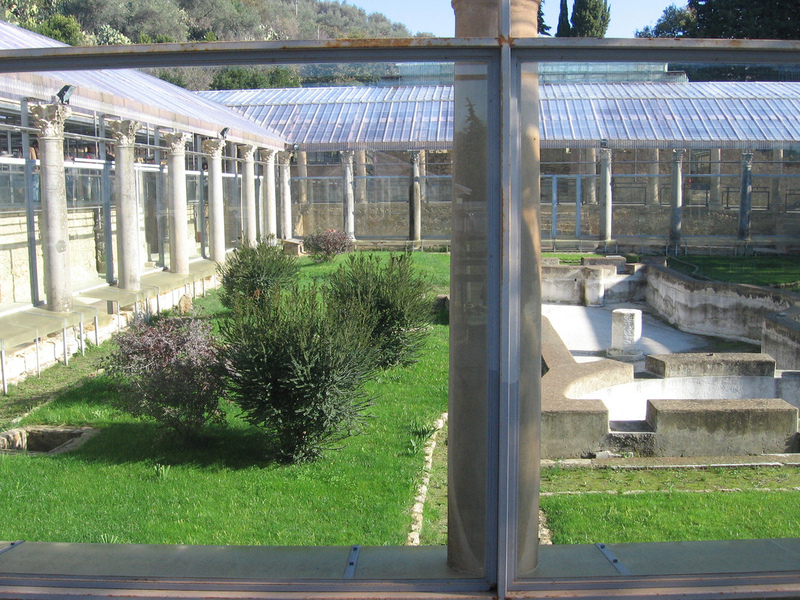 This is a view of the peristyle as it looks today. We are walking–we’ve come from the North Gate, we’re walking along, we’re hitting the peristyle. We’re going to be going from the peristyle into that domed area here. Imagine views through the columns of the peristyle–and some of those columns are still preserved, as you can see them, the original columns–views clearly of the Temple of Jupiter and of the Mausoleum of Diocletian on the other side. Arcuated lintel here inside a complete pediment. So that scheme also used as the major decoration of the peristyle in the Palace of Diocletian. Here’s a view of what the small Temple of Jupiter looks like. We’re looking–it originally had a statue of Jupiter; now it has a statue of St. John the Baptist. But you can see the shape — very much like the Curia, a box-like shape. Very simple, in this case not with a flat coffered ceiling, but with a barrel vaulted coffered ceiling. But again very simple, very geometric. And we can see that that barrel vault is exposed on the exterior. We can see the shape of the barrel vault from the outside, as well as from the inside. 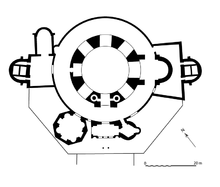 Here a view of the octagonal tomb and the plan of that tomb: an octagon with colonnade around it; columns on the inside; radiating rectangular and curved niches. But a porch, the whole idea of the porch–not unlike the Pantheon, except that it’s octagonal instead of round–porch on the front; deep porch; freestanding columns; façade orientation; single staircase. So this is very similar to things that we’ve seen earlier. 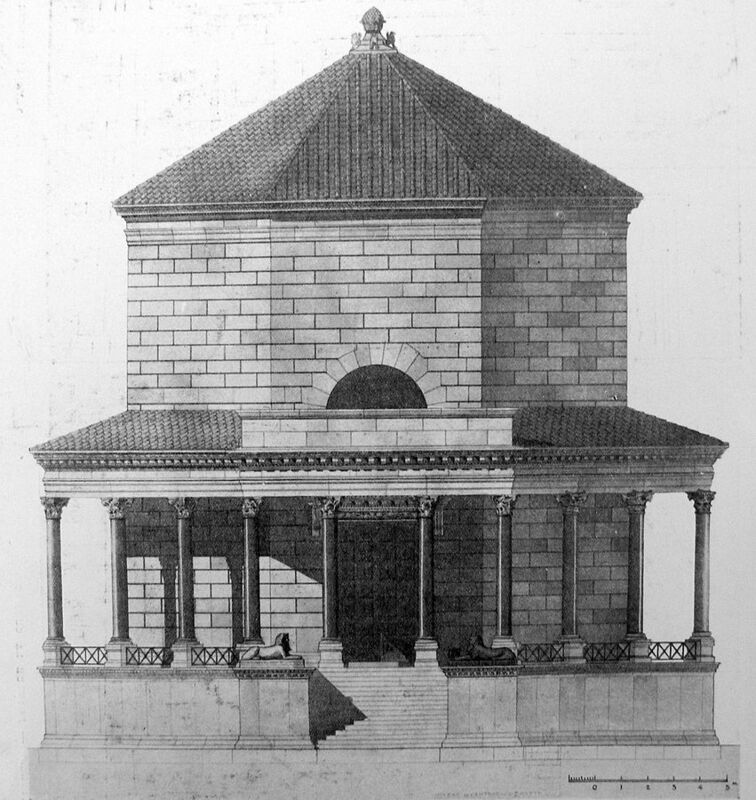 And two quick views, one an engraving of what the mausoleum, the octagonal mausoleum would have looked like, with its–you can see it’s faced with stone–with its entranceway façade and staircase. 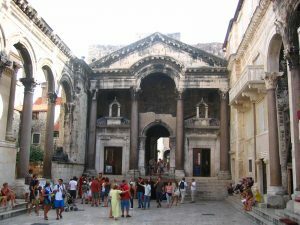 And here you can see it is very well preserved still today, in Split, where you see the surrounding columns. You can see the octagonal shape and the stonework, all still very well preserved, as is the interior. The interior very ornate, with columns projecting from the walls, supporting these projecting entablatures, deeply drilled, dematerialized, in the baroque manner, with lots of sculptural decoration. Here’s another view, perhaps a better one that just gives you some of the sense of the over-decoration, over-ornamentation, the baroque effects of the interior of the tomb. So a very different feel to the Temple of Jupiter, than to the Tomb of Diocletian himself. Here he’s gone all out and commissioned the most ornate possible decoration, with all the baroque effects that we’ve described, in two tiers, for the interior of his mausoleum. 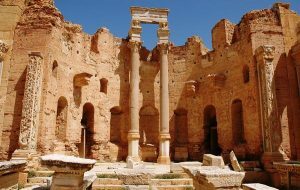 I want to show you a succession of other palaces, each fairly quickly, other palaces that were built during this period, that may have been–well in some cases we know for sure, but in other cases we’re not as sure whether they were in fact palaces for the Tetrarchs. This is the one that’s the least certain. It’s a palace in the western part of the Empire that we believe may have been the palace of Maximian, Augustus in the West. And in fact I should–yes, so let’s look at that first. 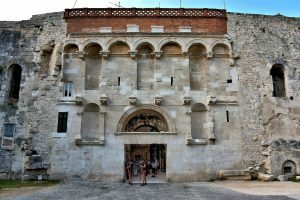 And that dates to sometime in the early fourth century A.D.
Now if you look at the plan of this quickly, you will see that it is very, very different in feel from–and in plan–from the Palace of Diocletian at Split. 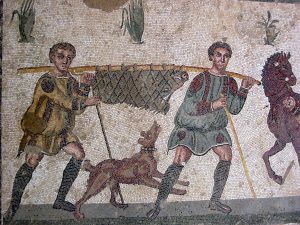 This may have something to do with the personality of Maximian, or whoever the commissioner was, but it may also have to do with the fact that this is not on the sea but in a remote town in south-central Sicily, which was much less likely to be under attack than the palace at Split. In fact, as you look at this, you must be reminded, I’m sure, of the Villa of Hadrian at Tivoli; it is very similar to that: a sprawling villa with a series of very interestingly shaped rooms, spread across the terrain, interacting with nature, just as they did at Hadrian’s Villa at Tivoli. Very much a countryside villa, and I think Hadrian’s Villa clearly the main model. 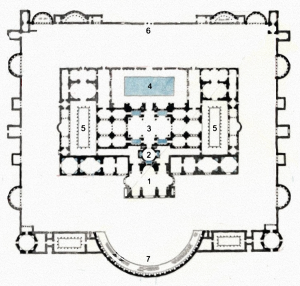 In the plan, we see a horseshoe shaped vestibule, with columns all around this villa (represented in the plan by dots); just like Hadrian’s Villa at Tivoli, does have a lot of columns. We see those here. 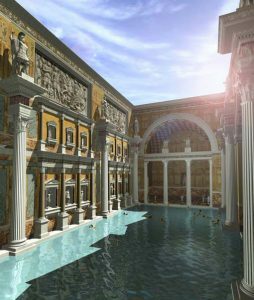 There is a peristyle court, with columns all the way around; a pool in the center, an interestingly shaped pool in the center; and then a series of living spaces, to either side. 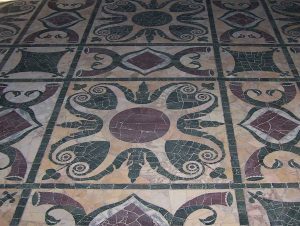 We see a transverse corridor, which is very important because it links various parts of the villa to one another, but it was also very decorated with mosaics, many of which are preserved. One can visit it still today. Parts of it are very well preserved. We’re clearly looking at the peristyle court with the pool in the center of it, right here. And again it is particularly well known for its mosaics. We see a long corridor here, with those mosaics. They depict primarily scenes of hunting, and I show you a couple of those scenes here. 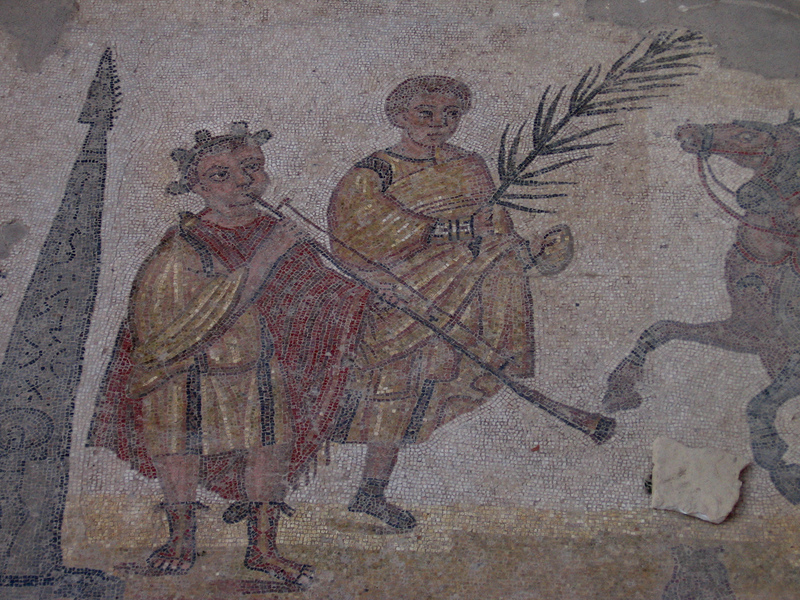 And there’s been some speculation that this was not Maximian’s, that it may have belonged to somebody who, like those individuals who had the Hunting Baths at Leptis Magna, whose work it was to collect wild animals from Africa–Africa is very close to Sicily–collect them from Africa and send them, to supply them to amphitheaters around the world. 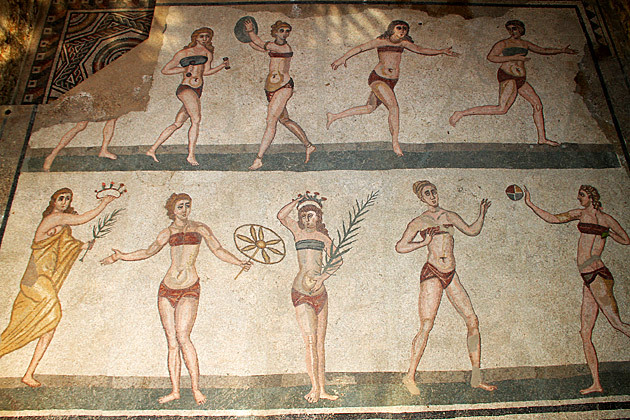 But even though most of these scenes are hunting scenes, the most famous mosaics from the Palace of Maximian, so-called, at Piazza Armerina in Sicily, are the so-called bikini girls, and I show you the bikini girls right here. And there’s nothing like this mosaic anywhere else in Roman art. But you can see why they’re called the bikini girls, and they are involved in all kinds of athletic activities. One of them has received a crown and a palm branch for her excellence. This one is twirling who knows what here. These two are playing–passing–playing ball. And over here we see a woman on the left with her five-pound weights, working out. So, I mean, this is probably as close as we get to–one doesn’t–this is very hard to interpret exactly what this means and what it’s all about and why it’s here. 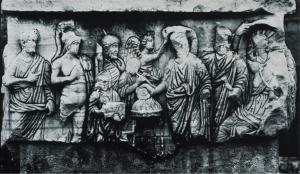 But perhaps we can see it as a kind of women’s version to the mosaic that we saw in the Baths of Caracalla, with the famous athletes of the day; I mean, perhaps these were famous women athletes of the day, some of whom were good enough even to be awarded prizes. But the jury is out on exactly what these were and why they’re there. 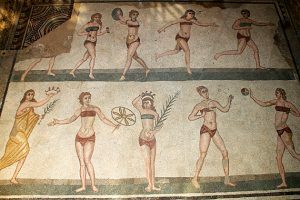 But they’re memorable, these inimitable bikini girls, and very, very famous — along with the Alexander Mosaic, probably the most famous mosaic surviving from Roman antiquity. I want to show you just very briefly, to give you an inkling of a couple of more palaces. 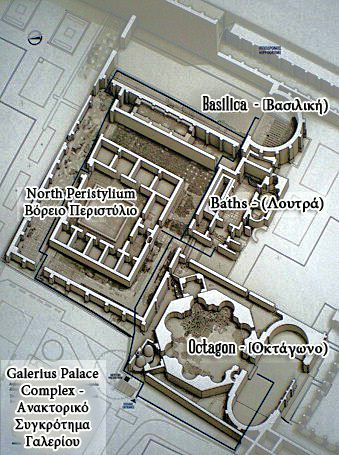 One of these we know for sure is the Palace of Galerius in the northern part of Greece, the Palace of Galerius. Galerius, as you’ll recall, was the Caesar in the eastern part of the Empire, to Diocletian. And I should mention–I think I neglected to mention–that Diocletian did, by the way, abdicate on the 1 of May in 305 A.D. He voluntarily stepped down, and when he voluntarily stepped down, two new–the Caesars were elevated to Augusti, and two new Caesars were chosen; two new Caesars were chosen. And Galerius became an Augustus, and he built for himself this extraordinary palace in northern Greece at Salonica. And we can see from this plan–and I’ve given you the date of it, to 297 to 305 A.D.; I’ve given you a plan of it, and you should be, even though only part of it survives, you should be immediately reminded of palaces that we’ve already looked at, not just today but in the past. 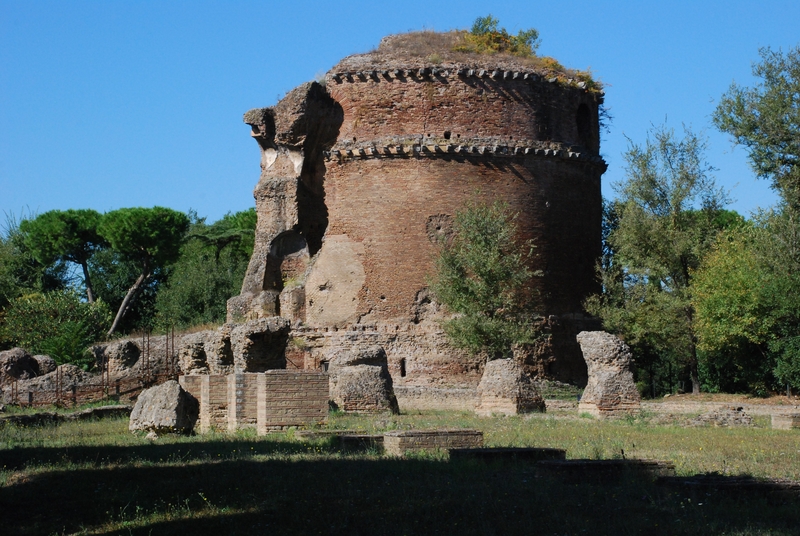 Think of Domitian’s Palace on the Palatine Hill. There’s a hippodrome here, just as Domitian’s Palace had, although Domitian’s Palace, it was used, as you’ll recall, as a sunken garden. We’re not sure how it was used here, but we think it may have actually been used as a circus here. 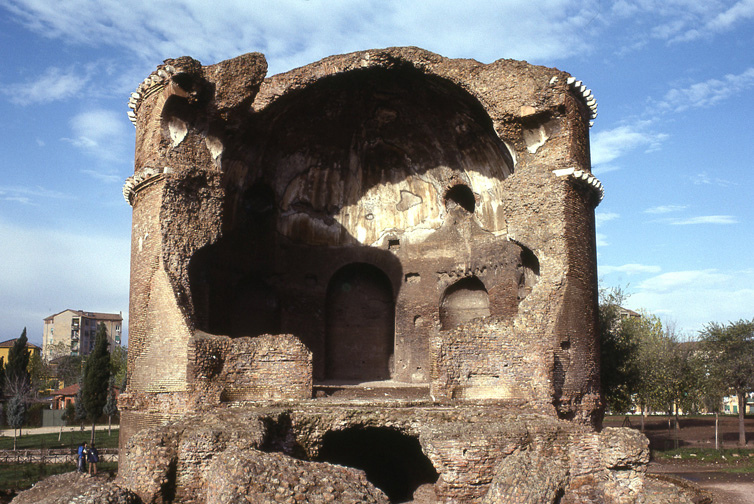 Other rooms, including an octagonal one, with alcoves, looking sort of like what Rabirius designed, again for Domitian’s Palace on the Palatine Hill. 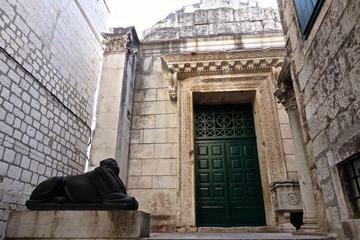 But up above we see, just as Diocletian’s Palace at Split, it includes a tomb. Galerius has also provided for himself and his afterlife by creating a round tomb. You see the uppermost part in this plan from Ward-Perkins. And then very interestingly, just like Diocletian’s Palace at Split, you can see two major, what look like major roads, colonnaded roads, colonnaded streets, that intersect in the center, just like Diocletian’s Palace. And then in the center of that, where they intersect, there’s a four-sided arch that I’m going to show you in a moment, that’s still preserved. 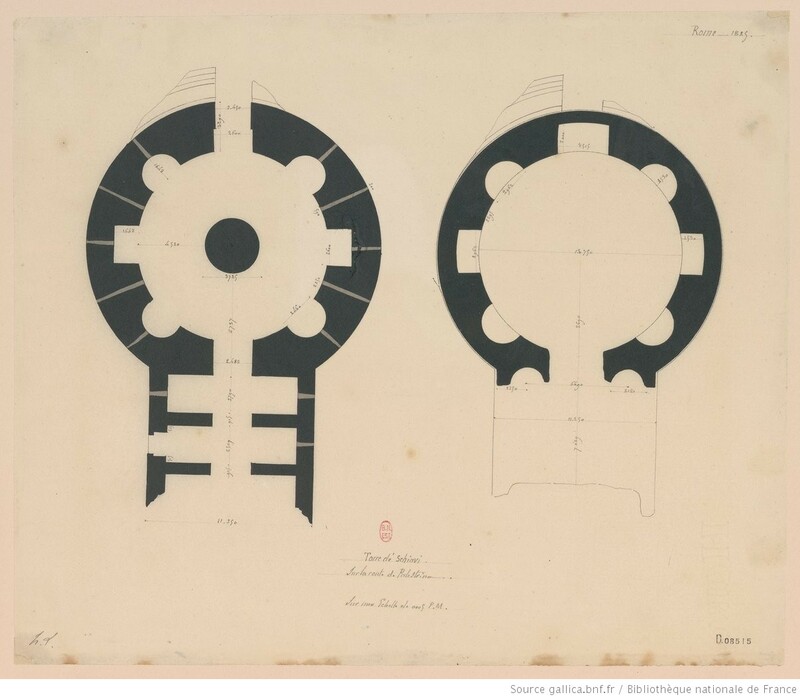 Here’s a plan of the Tomb of Galerius, at his palace, in this case round with radiating, rectangular alcoves. You see it here. It’s actually very well preserved. Here’s the interior, showing again, just as we saw in the Baths of–the octagonal room in the Baths of Diocletian, use of windows in the second tier, right at the base of the dome, rather than an oculus. And we see that also very well in plan. In fact, there were two sets of them, as you can see here. So they’ve abandoned the oculus in favor of these windows at the base of the dome. And then from the outside you can see that here they have used concrete faced with brick for the exterior of the structure, which was turned into a church–and you can see some mosaics from when it was turned into a church–and a minaret was also added at one other point in time. Here’s a spectacular view of the tomb as it looks today in Salonica. 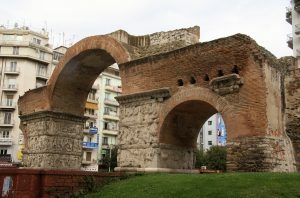 You can see it here; the exterior, as well as its relationship along what would have been one of those colonnaded streets, with the arch, which is in part preserved — the so-called Arch of Galerius. You can also see from this view how similar modern Salonica is to modern Athens: same country, same World War, post-World War II construction; mostly residential houses of five, six, seven stories, white in color, with balconies, as you can see. Here’s a view of the relationship of the tomb to the arch. These two colonnaded streets that intersect, and at that intersection the placement of the arch. The arch was four-sided so the streets could go underneath it. 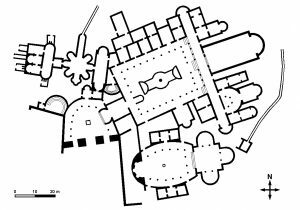 But it was also double-bayed, as you can see here: single, central large bay and one smaller bay; and then the piers decorated with sculpture, that give us a report on the exploits, the military exploits of Galerius in the eastern part of the Empire. 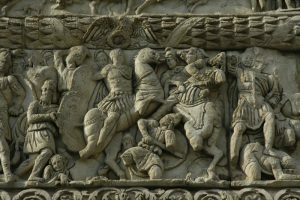 These were Galerius’ wars, Galerius’ victories that are depicted here. 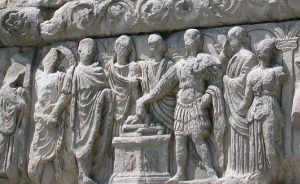 But we do believe that since it was one for all and all for one, that it honored the Tetrarchy as a whole as well, and that there were niches that were placed somewhere on this arch, that would have had in them representations, portraits, of each of the four Tetrarchs. 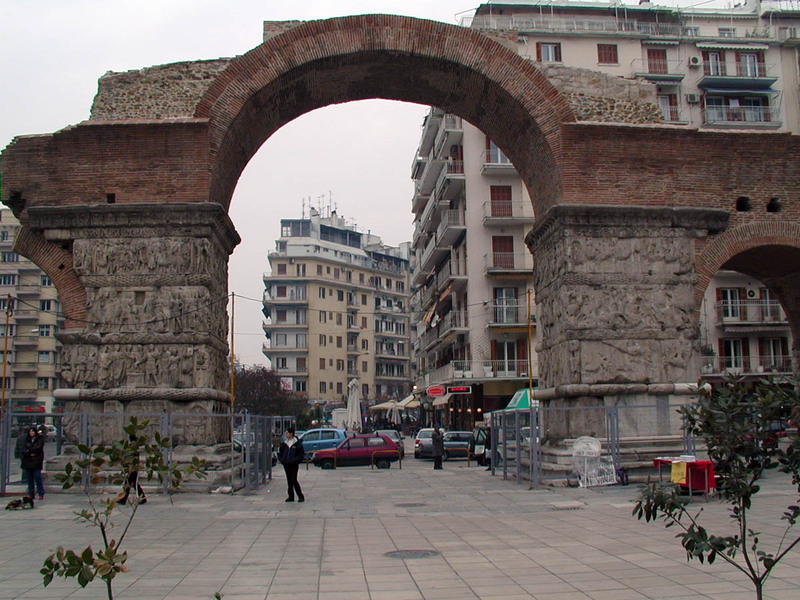 Another view of the Arch of Galerius, at Salonica, where you can see its relationship, even today, to what was once the Tomb of Galerius, here. And a more detailed view of some of the scenes, and how crowded they are, with one rectangular panel, piled one on top of another, and decorative motifs in between them. 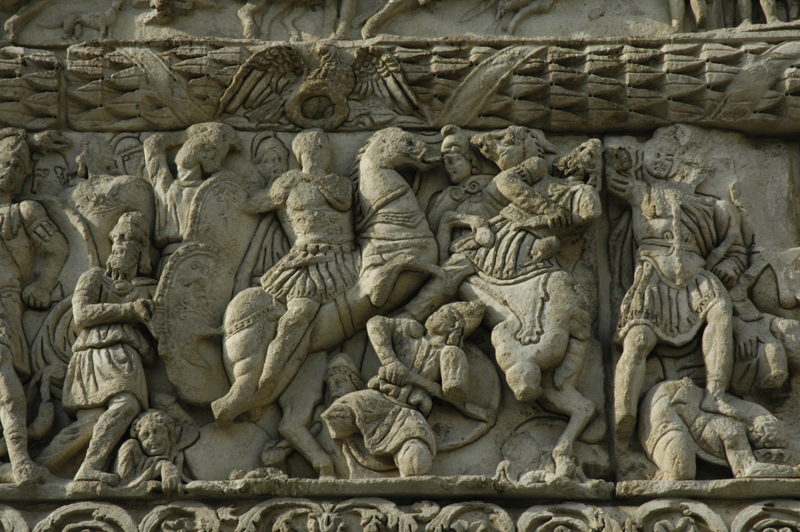 And if we look at a detail, we see the usual scenes that we see on things like this: the emperor sacrificing; the emperor on horseback, trampling barbarian enemies; the emperor seated, with the other Tetrarchs, and with a host of gods and goddesses and personifications. So again an honoring of Galerius’ own personal victories, but an expansion of those to include reference also to the Tetrarchy as a whole. We’re going to be talking next time about two men in particular: a man by the name of Maxentius and Constantine the Great. Constantine the Great, as I’ve already mentioned, was the son of Constantius Chlorus. Maxentius was the son of Maximian. So we see the generations continue, and the sons of the Tetrarchs also want to be Tetrarchs themselves, if not sole ruler. And we’ll see Maxentius and Constantine do battle against one another in Tuesday’s lecture. 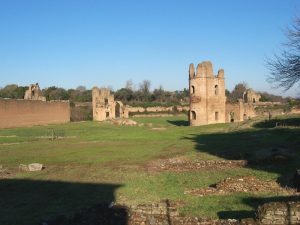 But I just want to mention–we’ll talk about Maxentius in some detail next time, especially his construction, or the beginning, his beginning construction on a great basilica in Rome, that Constantine eventually finished, the so-called Basilica of Maxentius/Constantine, or the Basilica Nova. But I want to mention just in passing today a villa, about a villa that Maxentius built in Rome, on the Via Appia in Rome, just to round the circle and to show you that some of these palaces were still–they were being built in these capitals elsewhere in the world, but were still being built in Rome. And we know that Maxentius built a villa in the early fourth century A.D., as I said on the Via Appia. And there are some remains of it today. 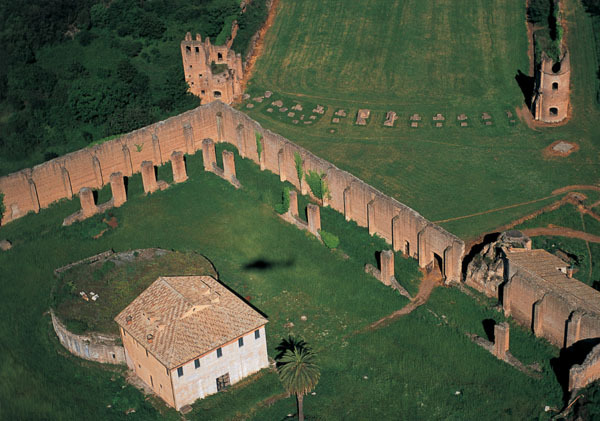 I show you a general view of those here, and a view, from the air, that shows you that part of that villa, which is still preserved, was another one of these hippodromes, the circus. 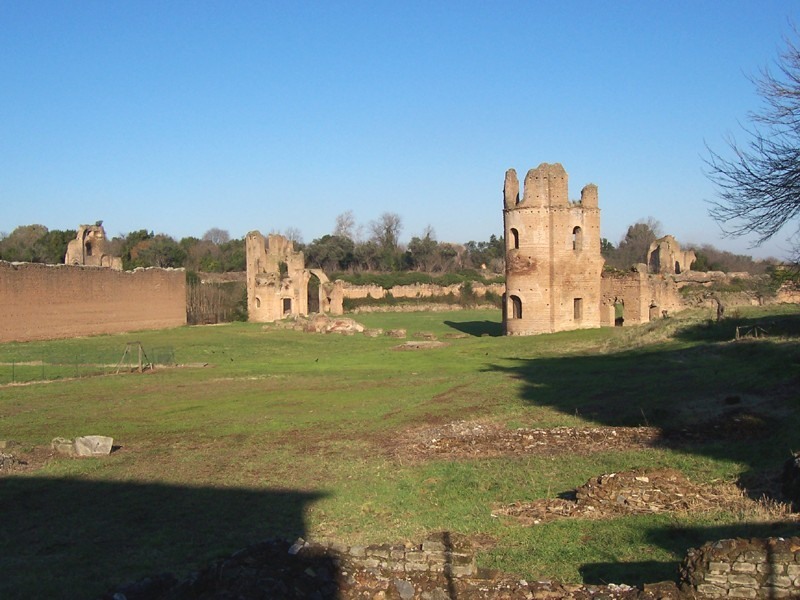 And in this case we know that this circus was used as a circus–horse races took place here–and that it was built to hold 15,000 spectators; 15,000 spectators to come out onto the Via Appia to see horse races at Maxentius’ villa. 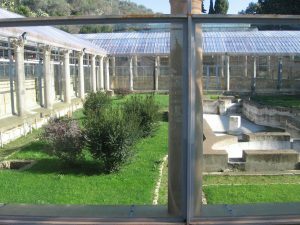 We also know that this villa had a tomb that Maxentius provided for himself, and perhaps for his family as well, inside his villa. 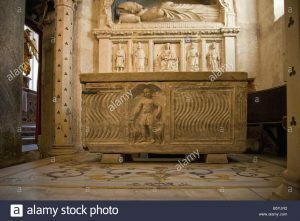 So we see the same idea that we’ve seen in the provinces, being used in Rome concurrently, a tomb that is not all that well preserved, but there is enough where we do believe it was a kind of mini Pantheon. This is a restored view of the circus. Also above are a close-up of the Villa and attached mausoleum (tomb) of Maxentius. It seems a mini-Pantheon connected to Villa house. 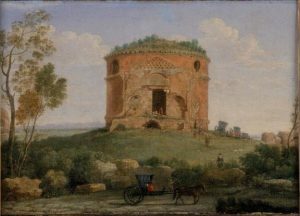 Another tomb that I can show you, that seems to have been quite like it, is this last monument that I’m showing you today, the Tor de’Schiavi, that was a tomb that was put up in around A.D. 300 on one of Rome’s other major streets, the Via Praenestina, as I’ve indicated on the Monument List. 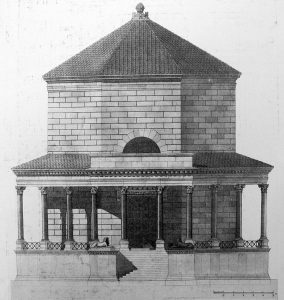 And once again we see this whole idea of the mini Pantheon, being used not as a temple to all the gods, but as a tomb; as a tomb, a round structure with a traditional porch on the front, a rectangular pediment, deep porch, freestanding columns in that porch, single staircase façade, emphasis here. You also see, interestingly enough, that this one we know did not have an oculus, and you can see that they have put windows at the base to provide light. These are not the usual windows that we’ve seen, that were arcuated at the top, but rather round windows, sort of portholes, into this particular tomb. 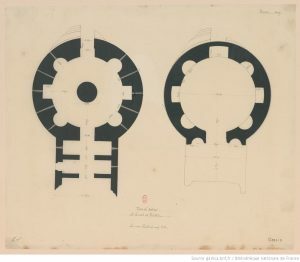 Up above you see the plan, as in Ward-Perkins, round with radiating, alternating curved and rectangular alcoves. There is some controversy about the porch, whether it had a regular, complete, triangular pediment, or whether it had an arcuated lintel. We’re not sure. Various scholars have put forward one view or the other. But the last thought that I want to leave you with is that it’s very interesting to see these mini Pantheons being used as tombs in late antiquity, by the Tetrarchs and by others, and if not mini Pantheons, octagonal structures that also look back to the past. And I think that’s important, and it’s a nice note to end on, because it reminds us that when Diocletian and the other Tetrarchs come into Rome, after the chaos of the third century A.D., and want to establish stability–once again, re-establish stability–what do they do? They look to the past. 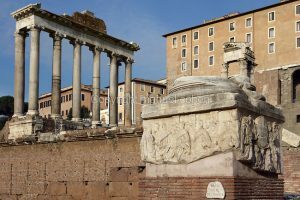 They build buildings in the Roman Forum, but they also look to the great architecture of their earlier counterparts, of Caesar–of the great leaders of the Roman past–Caesar, Augustus, Hadrian. They look to them, they look to their buildings, and they use their buildings as models to indicate that they are in a line from those earlier emperors, that they’re just as much in control, that they have brought stability back to Rome, and also to the Empire as a whole, which is why we see them building not just in Rome but also around the Empire, as they govern from the fringes, as well as they govern from the city of Rome.